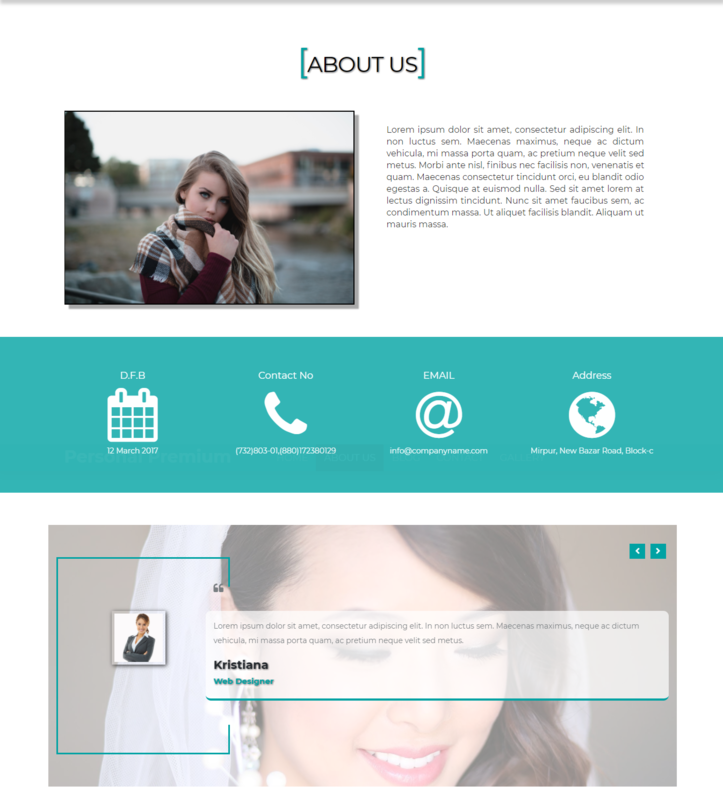 Personal is a Full Responsive Multi-Purpose Theme suitable for Business, corporate office, and others. Cool Blog Layout and full-width page. 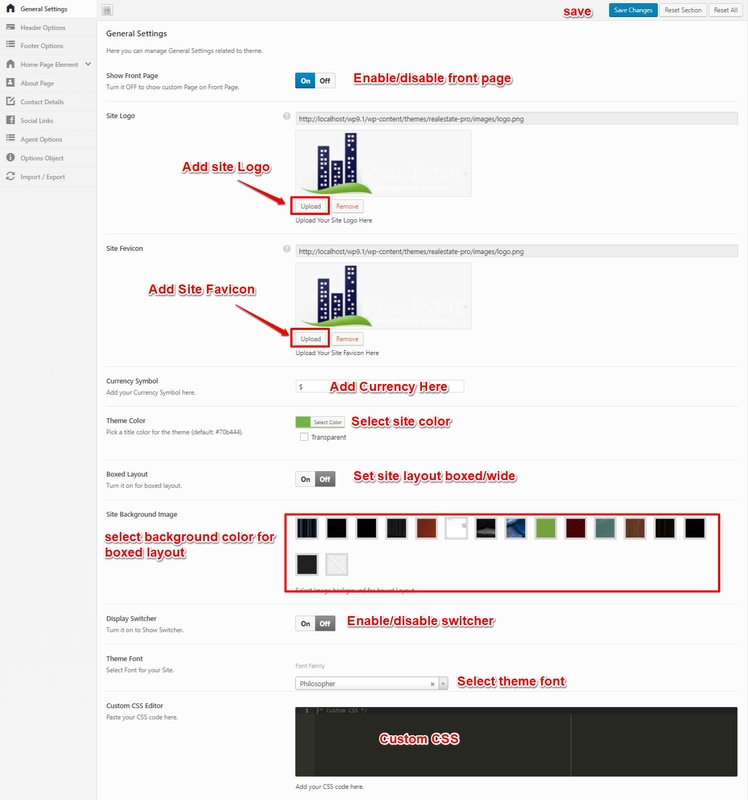 You can customize General options setting go to Admin Dashboard -> Appearance ->Theme Options -> Color Selection. Here you can change the theme color. 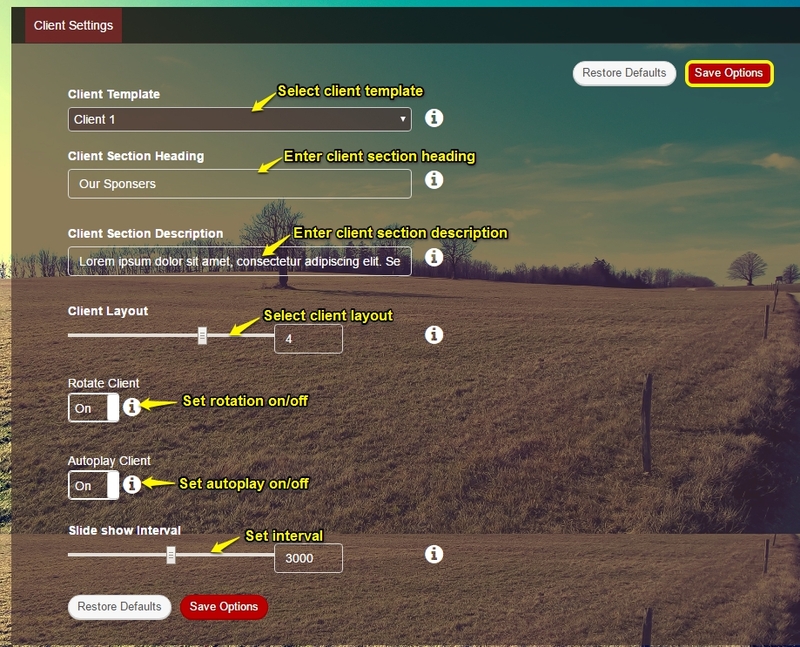 You can customize Background options go to Admin Dashboard -> Appearance ->Theme Options -> Background Option. 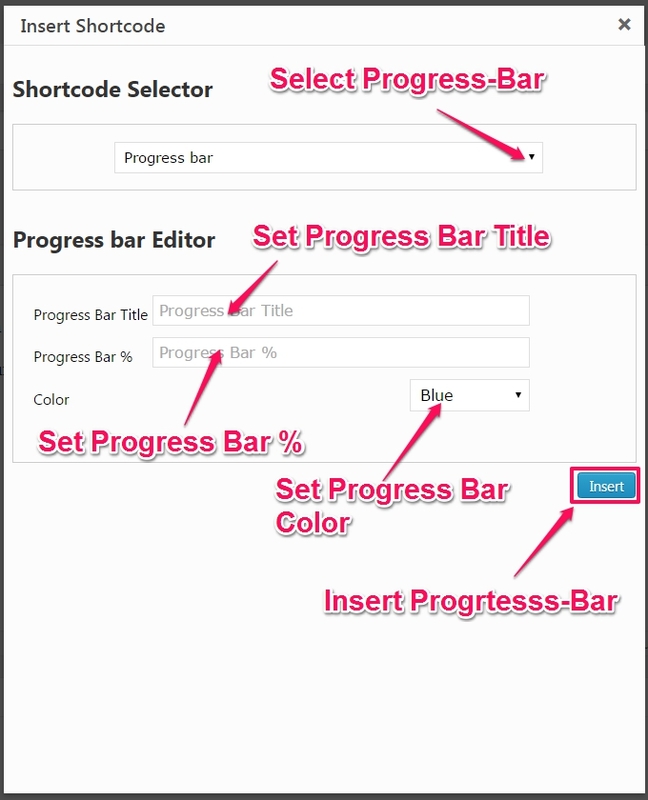 Here you can select Body background color and Image and options like background-repeat, background size, background attachment and background position. 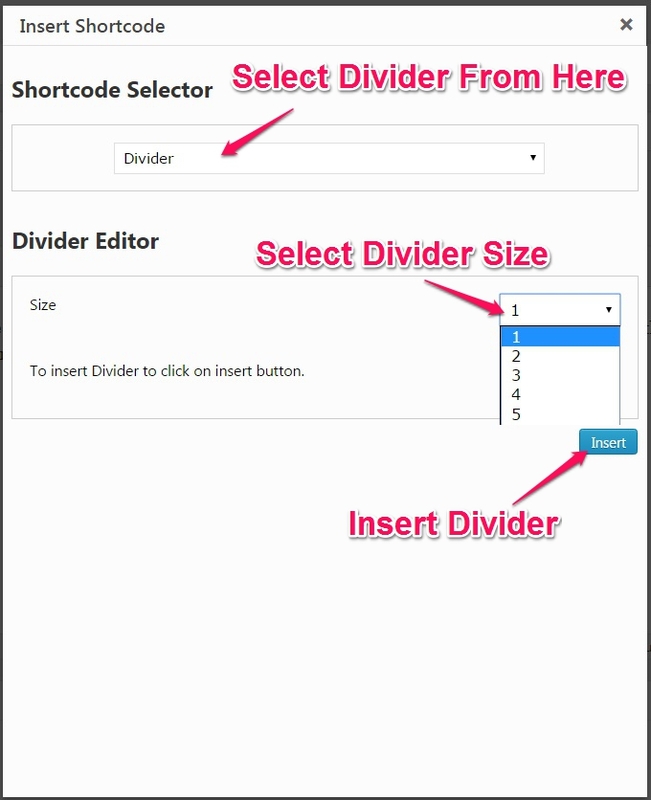 You can add slider go to Admin Dashboard -> Slider -> Add New Slide. 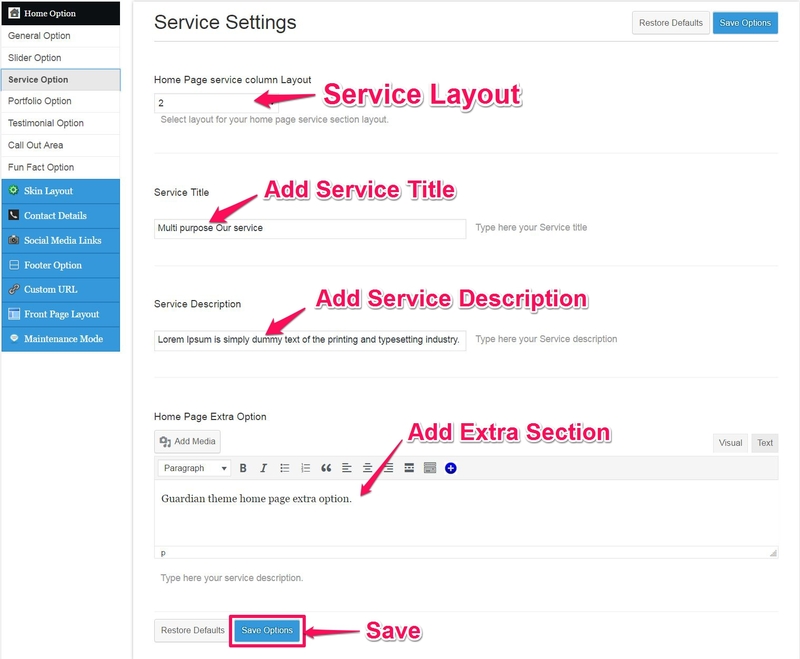 You can add Service go to Admin Dashboard -> Service -> Add New Service. 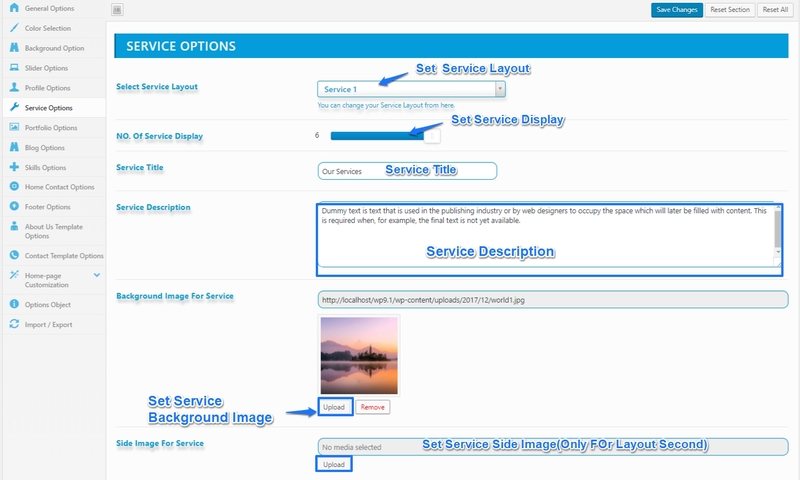 Side Image For Service – Side image is only for service 2 layout. 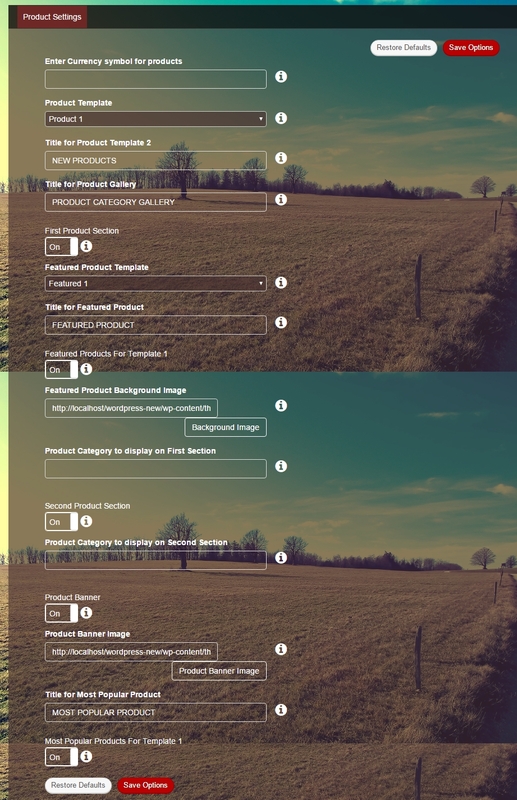 Set Side Image For Portfolio Second Template – Side image is only for Portfolio 2 layout. You can add skill go to Admin Dashboard -> Skills -> Add New Skill. No. Of Skills Display – number of skill display on home-page. About us Testimonial Background Image – Upload background Image Only For About Us Template. 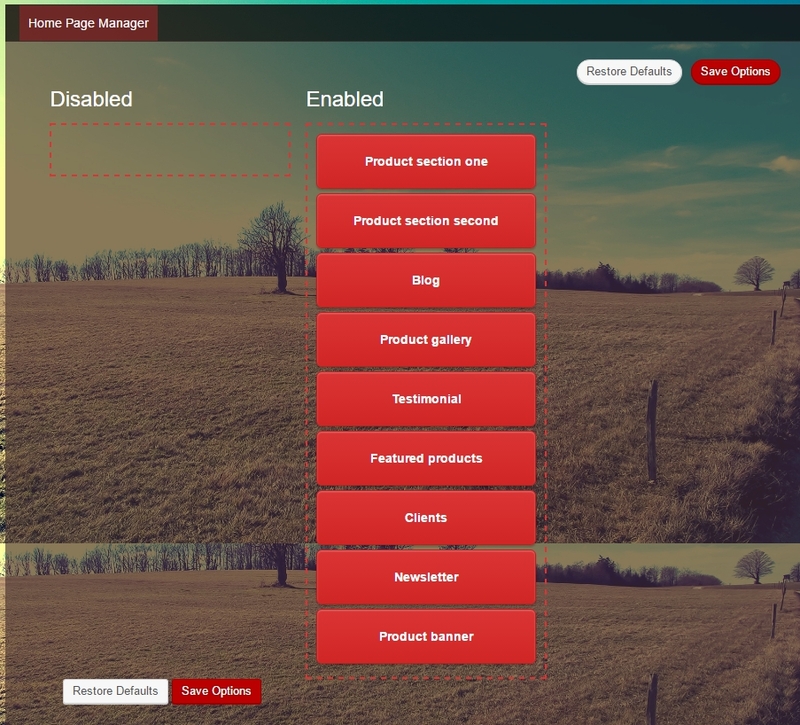 Homepage Layout Manager – Here section can be enabled/disable and move using DRAG N DROP. 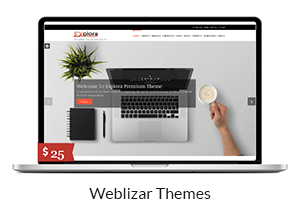 Personal Premium Theme comes with 16 template pages. We are explaining below one by one each, how to use or activate different templates. You can use full-width template go to Admin Dashboard → Pages → Add New. 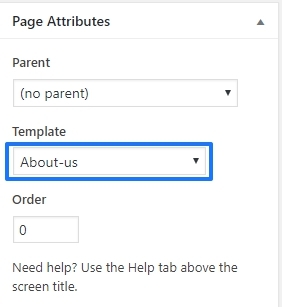 Now from Page Attributes section select About us template. 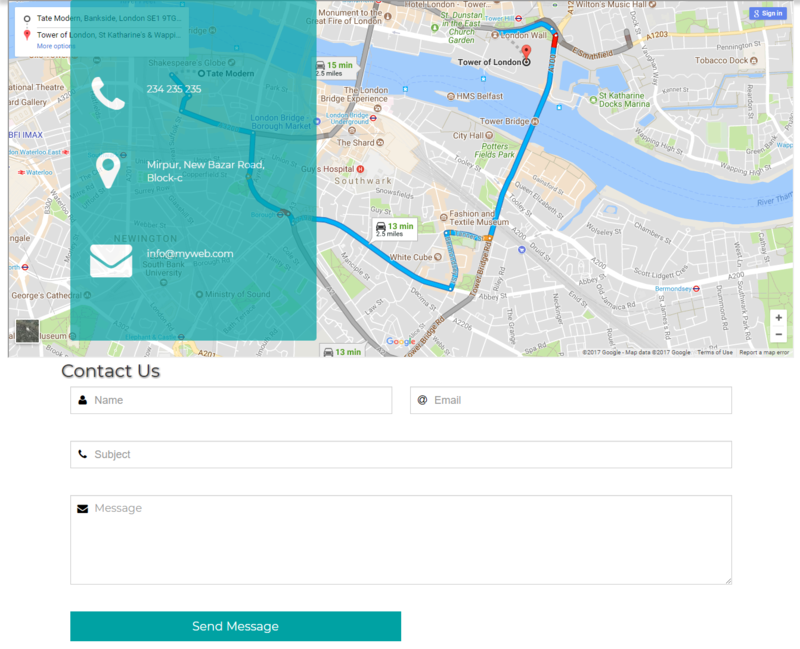 About US Page Template can be used to display your Business information, User reviews(testimonial info), Working information. 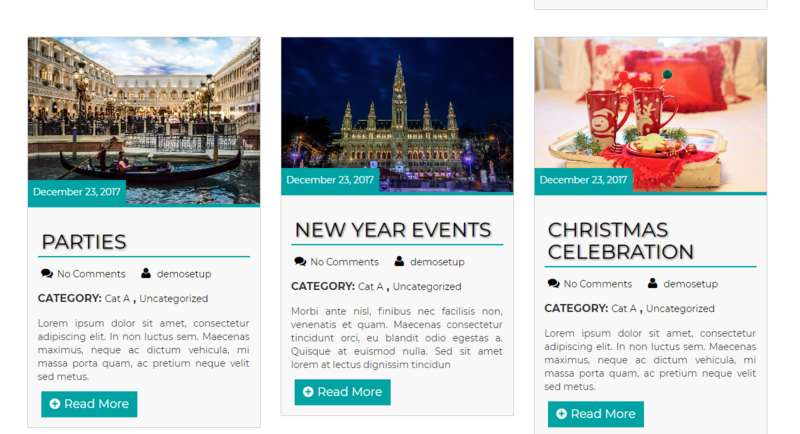 This template contains three section, first one for About Us information, the second one is for Working information and the last one is for User review(testimonial). you can add testimonial information go to Admin Dashboard -> Testimonial -> Add New Testimonial. 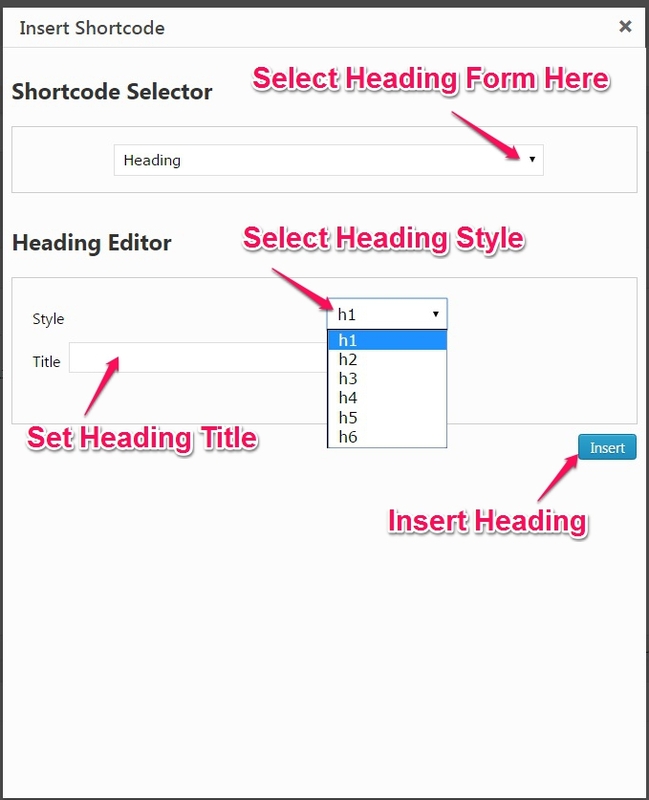 Using Page with the full width you can display a specific information in wide page layout. You can use full-width template go to Admin Dashboard → Pages → Add New. 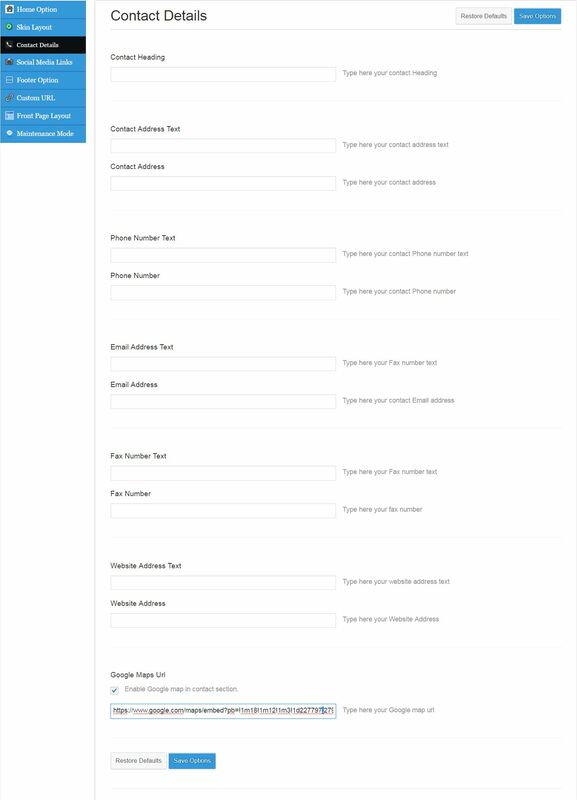 Now select Full With page template and Publish. 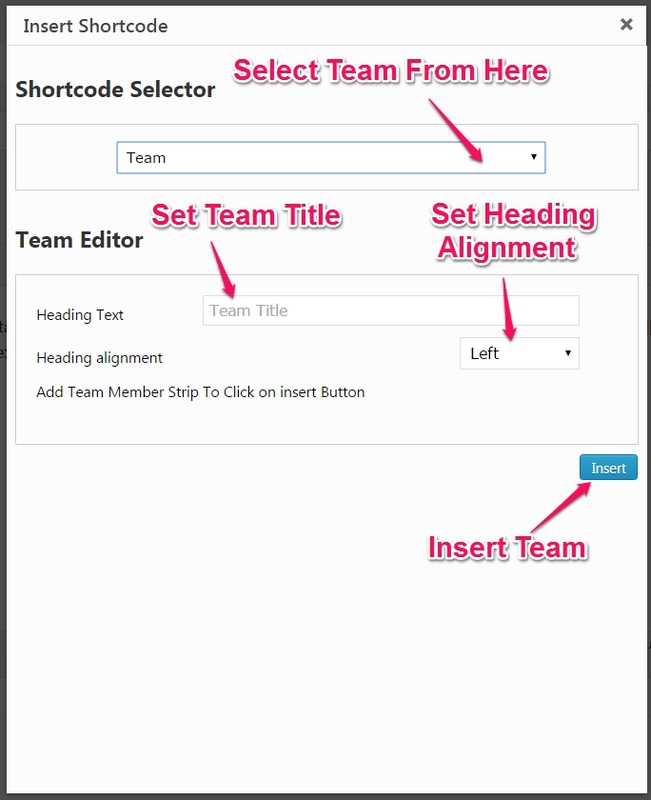 Using Page with Page-left With sidebar template you can display a specific information with left sidebar. You can use Page-left With sidebar template go to Admin Dashboard → Pages → Add New. 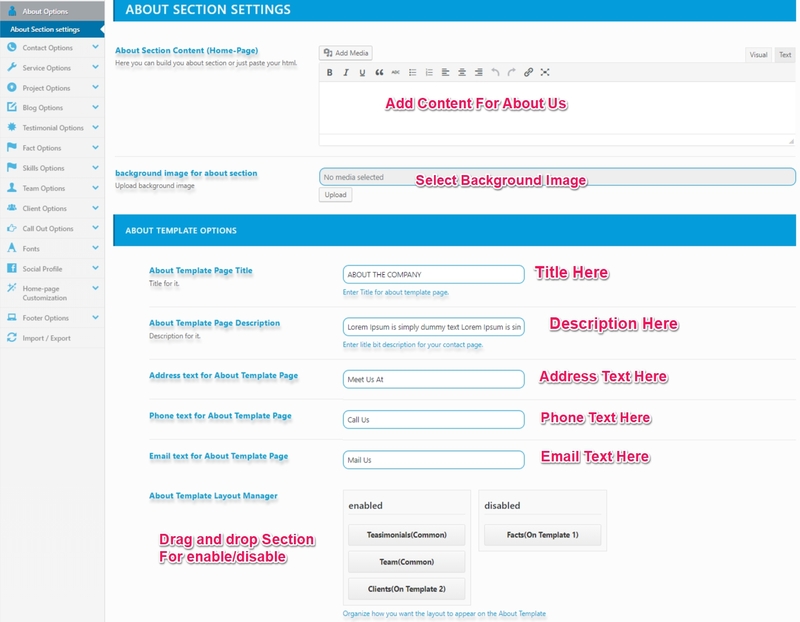 Now select Page-left With sidebar template and Publish. 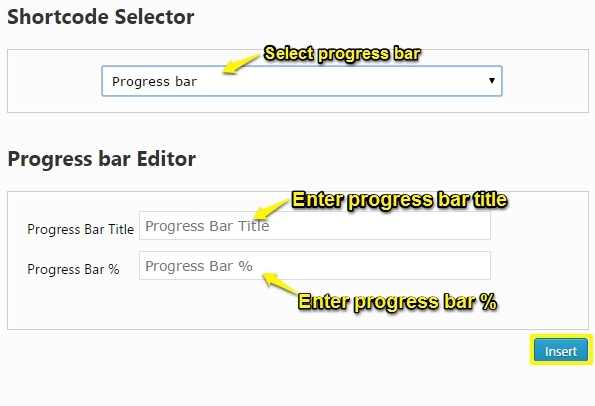 You can use Page-right With sidebar template go to Admin Dashboard → Pages → Add New. 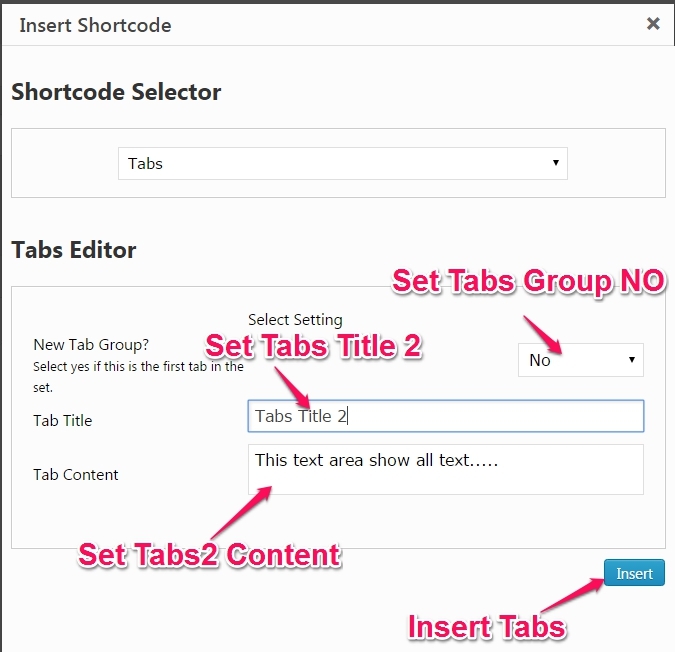 Now select Page-right With sidebar template and Publish. 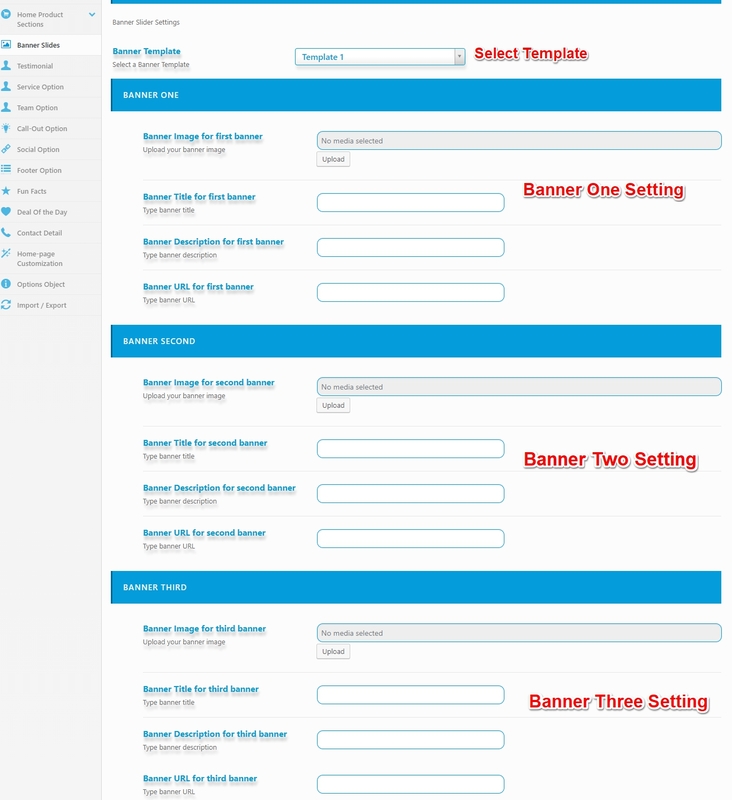 Blog template is used to display blog in different layout or format. 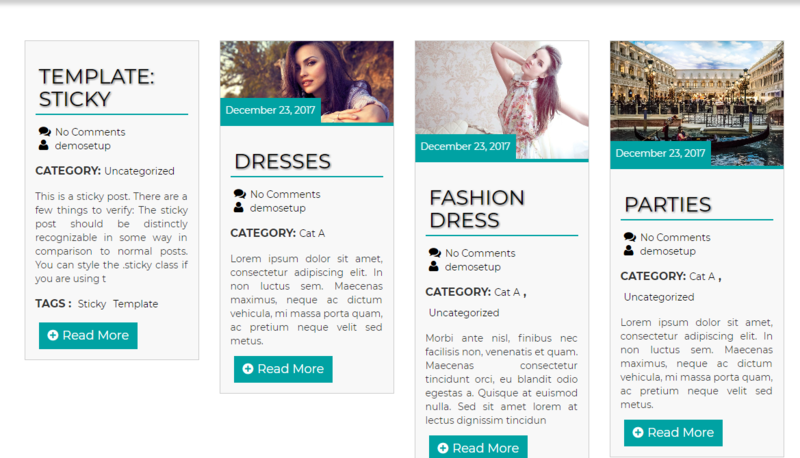 Theme contains 5 type of blog template. 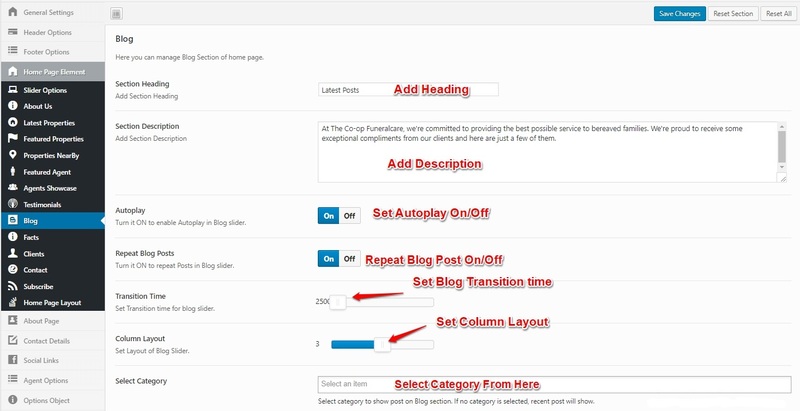 You can use Blog col 2 template go to Admin Dashboard → Pages → Add New. 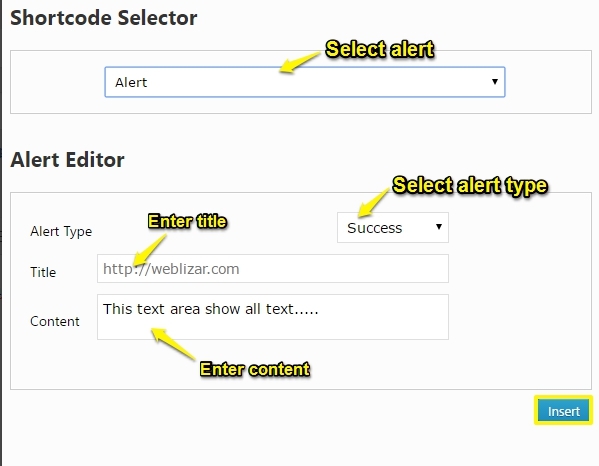 Now select blog-col-2-template and Publish. 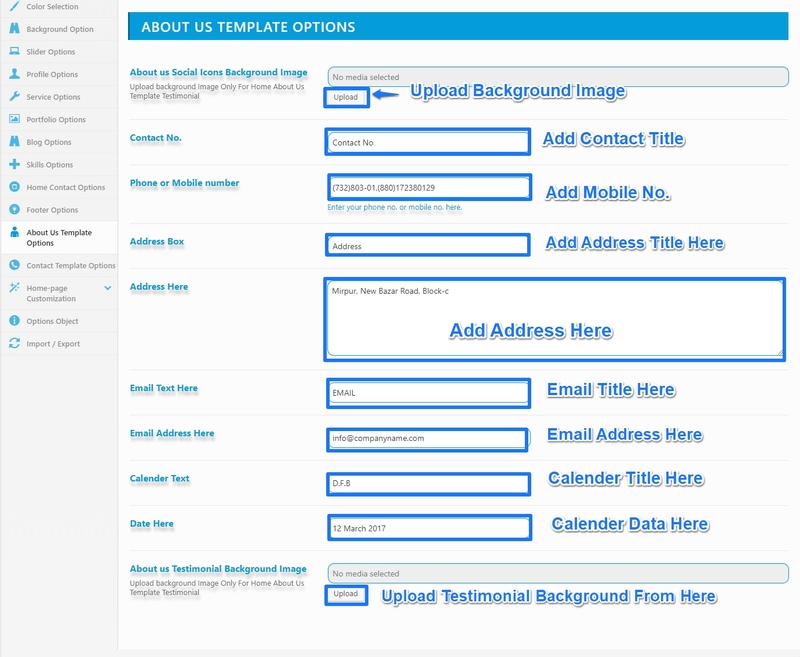 You can use Blog col 3 template go to Admin Dashboard → Pages → Add New. 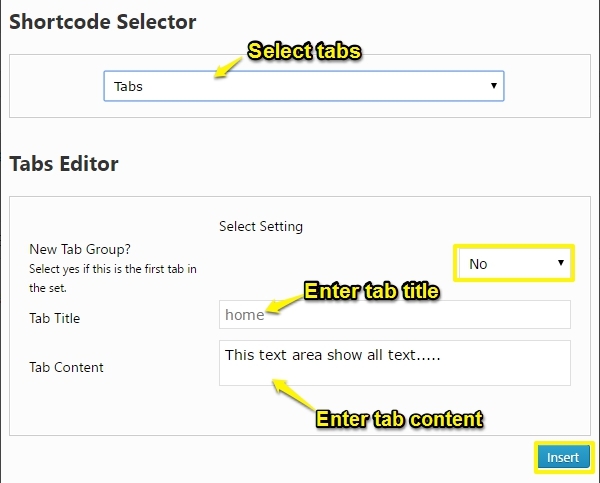 Now select blog-col-3-template and Publish. 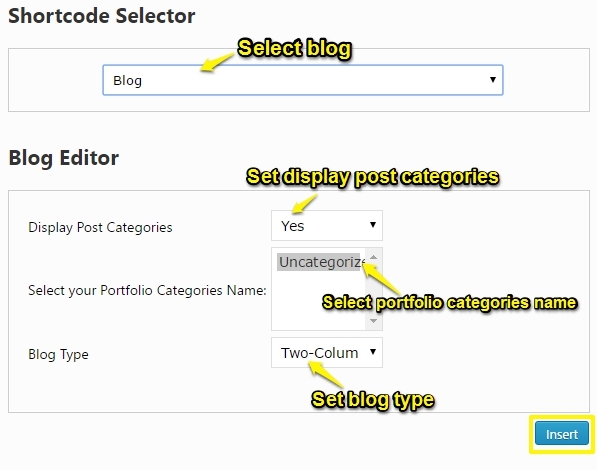 You can use Blog col 4 template go to Admin Dashboard → Pages → Add New. 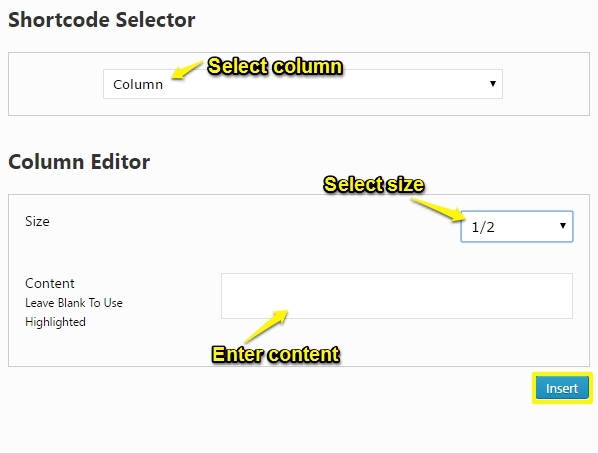 Now select blog-col-4-template and Publish. 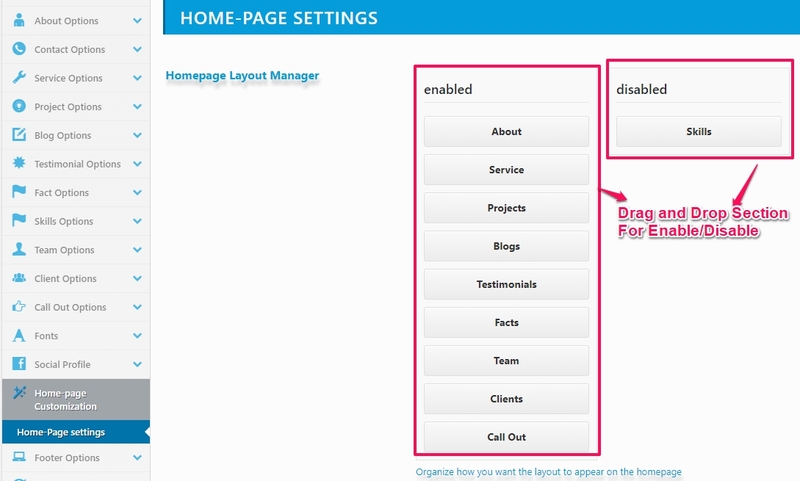 You can use blog full width template go to Admin Dashboard → Pages → Add New. 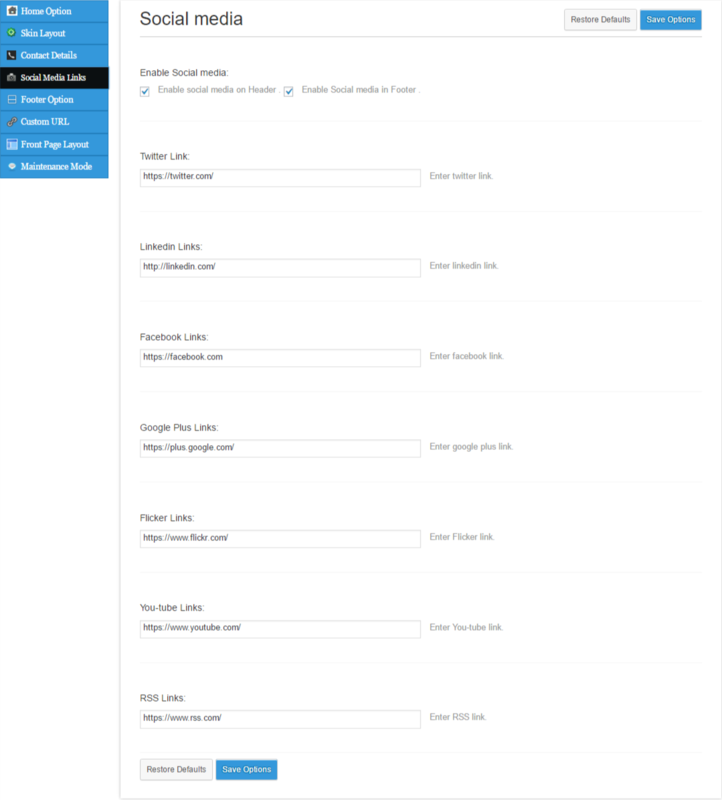 Now select blog-full-width-template and Publish. You can use Blog left sidebar template go to Admin Dashboard → Pages → Add New. 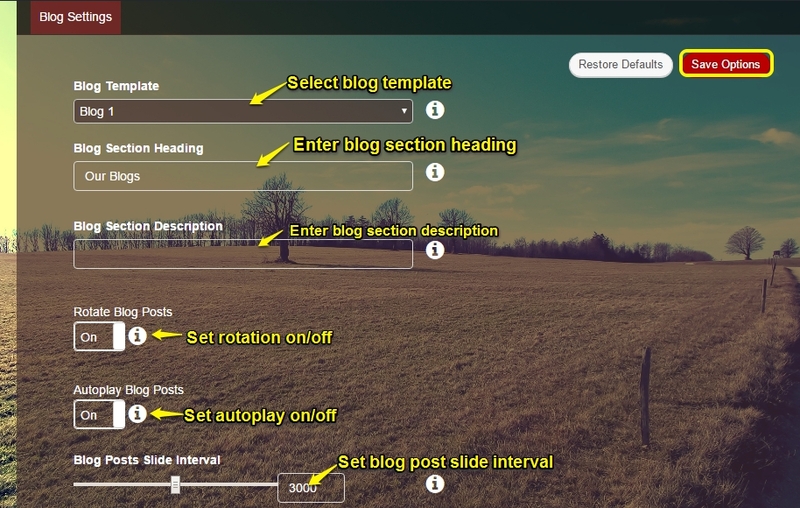 Now select blog-left-sidebar-template and Publish. 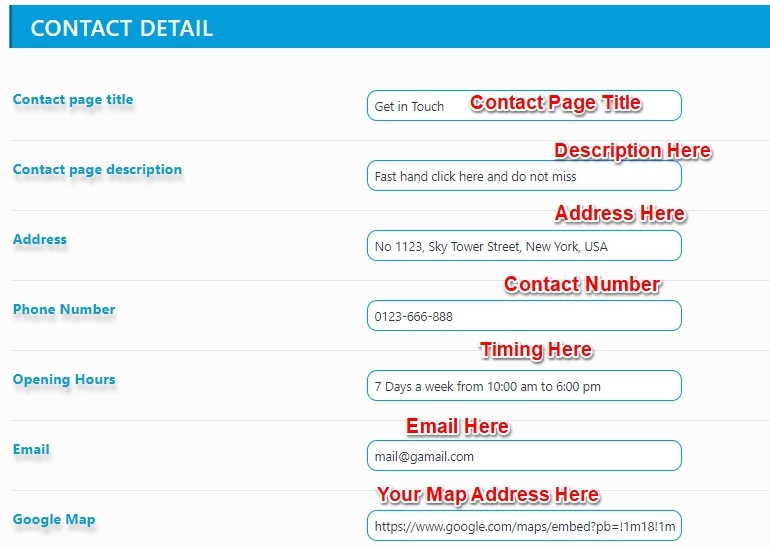 Contact Page Template can be used to display your Business, Office contact, and location information. 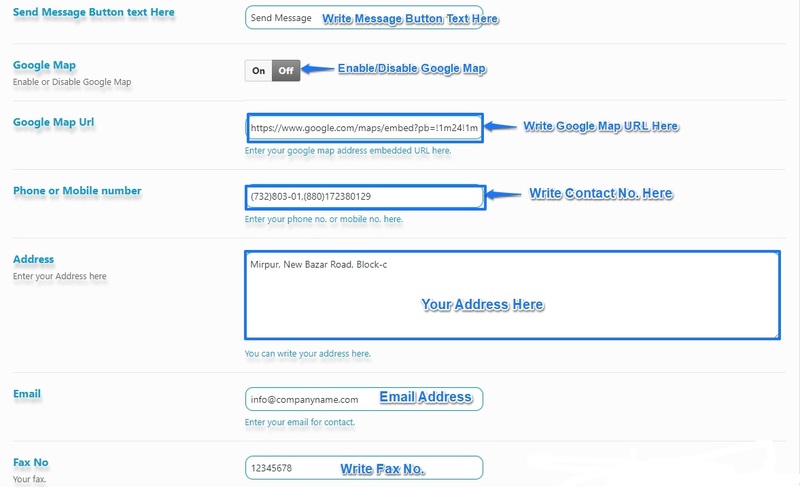 Other Contact & Location information like Google Map, Phone, Email and Office Address. 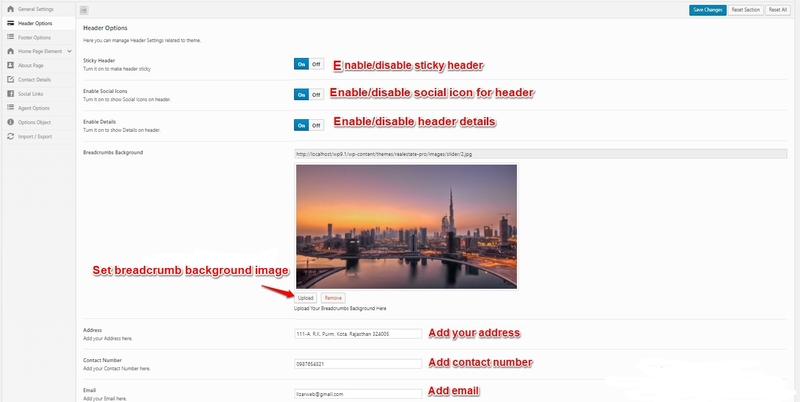 You can add the following information visit Admin Dashboard → Appearance → Theme Options → Contact Template Options. 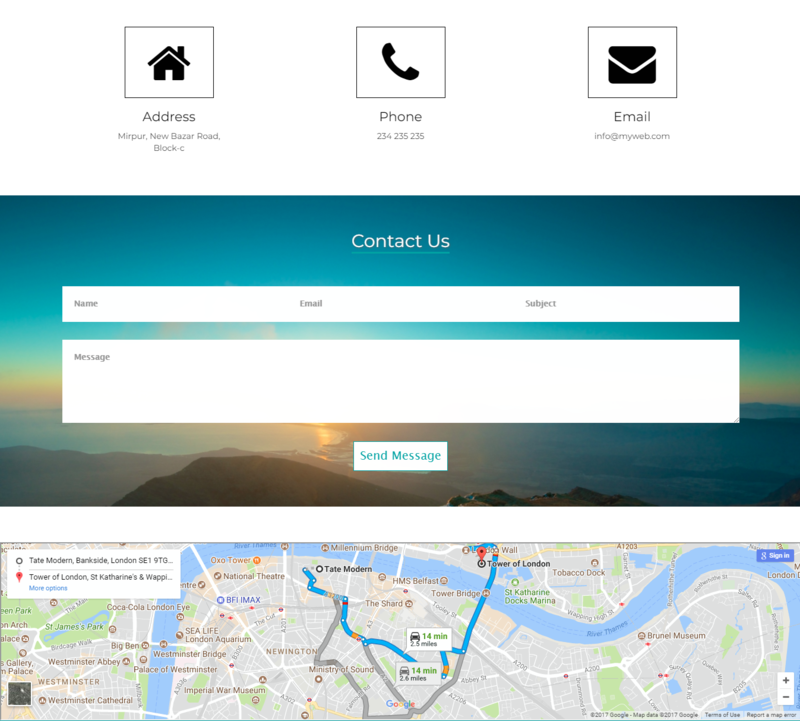 The theme includes 3 templates for contact us. You can use Contact-page-1 template go to Admin Dashboard → Pages → Add New. 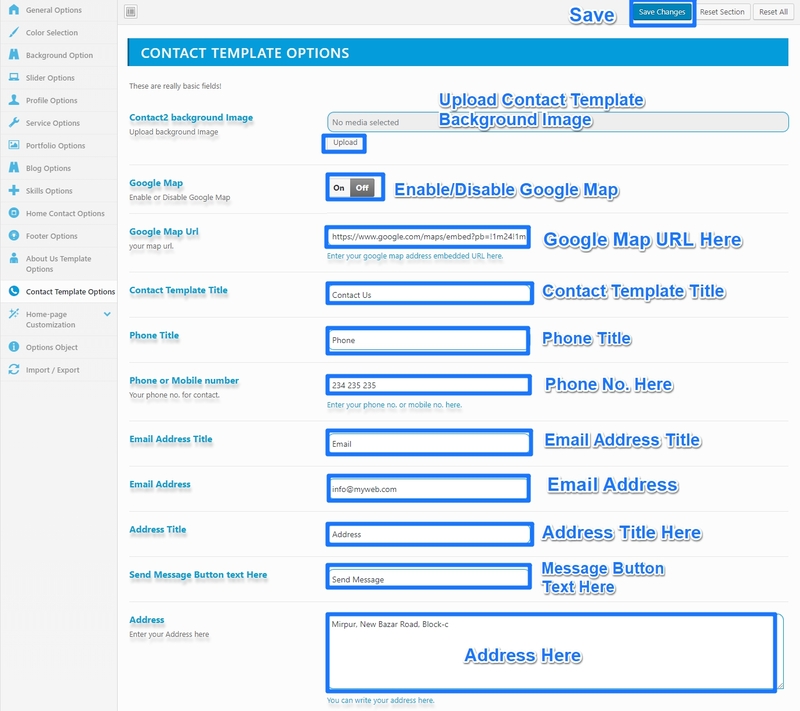 Now select a contact-page-1 template and Publish. You can use Contact-page-2 template go to Admin Dashboard → Pages → Add New. 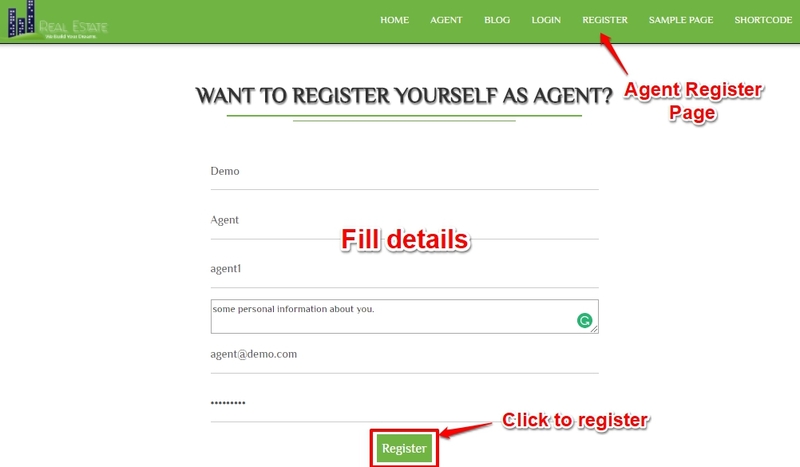 Now select a contact-page-2 template and Publish. You can use Contact-page-3 template go to Admin Dashboard → Pages → Add New. 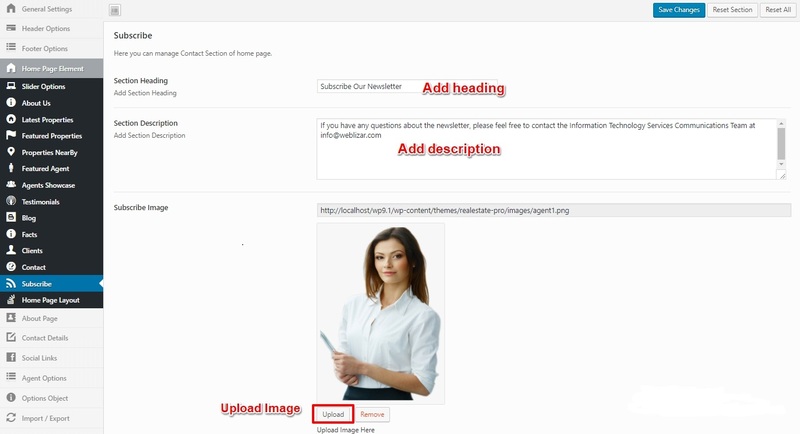 Now select a contact-page-3 template and Publish. 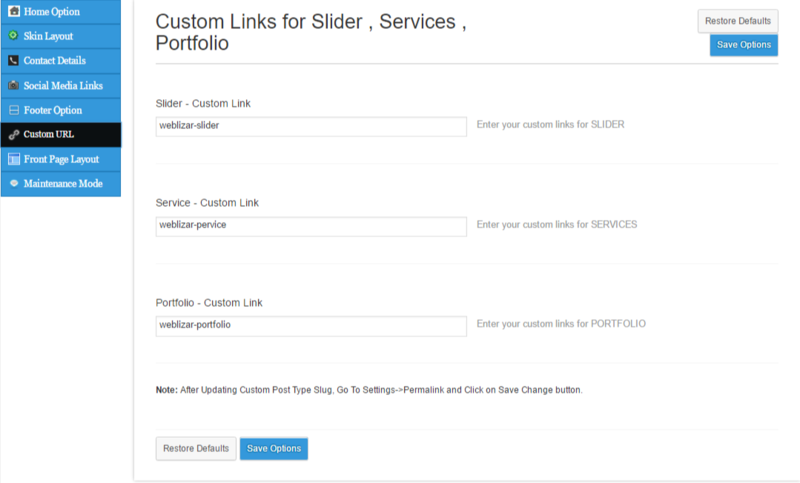 You can create your Portfolio Gallery. 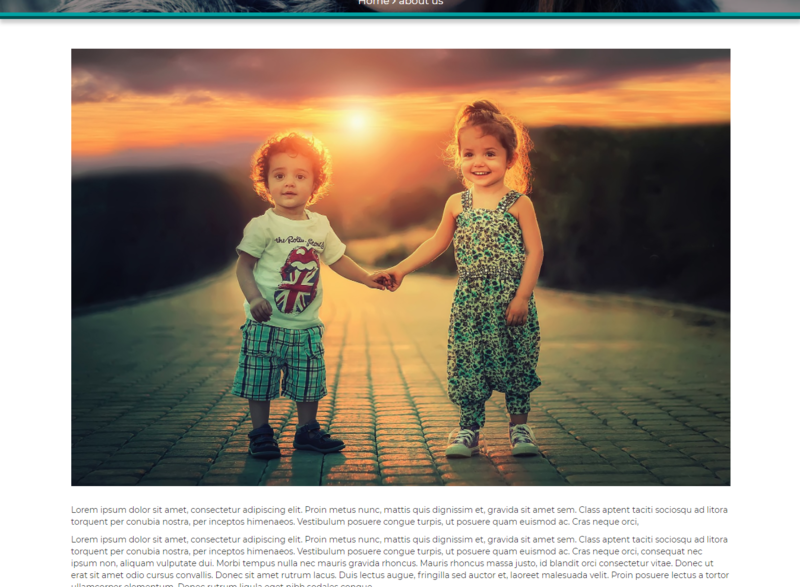 The theme includes 4 portfolio gallery template. Go to Admin Dashboard -> Portfolio -> Add New Portfolio. You can use Gallery-1 template go to Admin Dashboard → Pages → Add New. 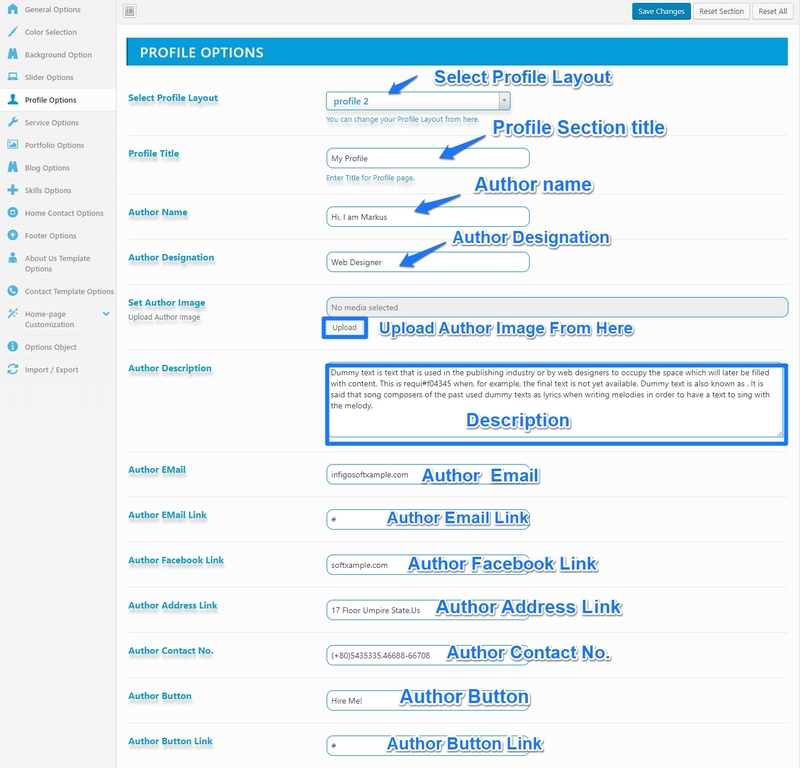 Now select a Gallery-1-template and Publish. You can use Gallery-2 template go to Admin Dashboard → Pages → Add New. 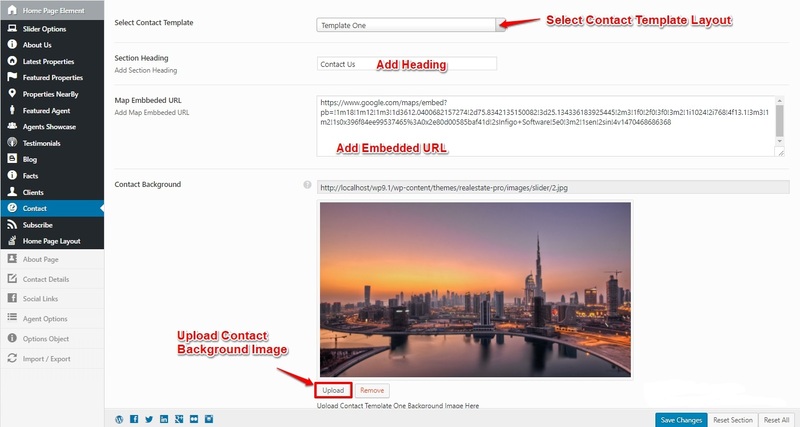 Now select a Gallery-2-template and Publish. You can use Gallery-3 template go to Admin Dashboard → Pages → Add New. 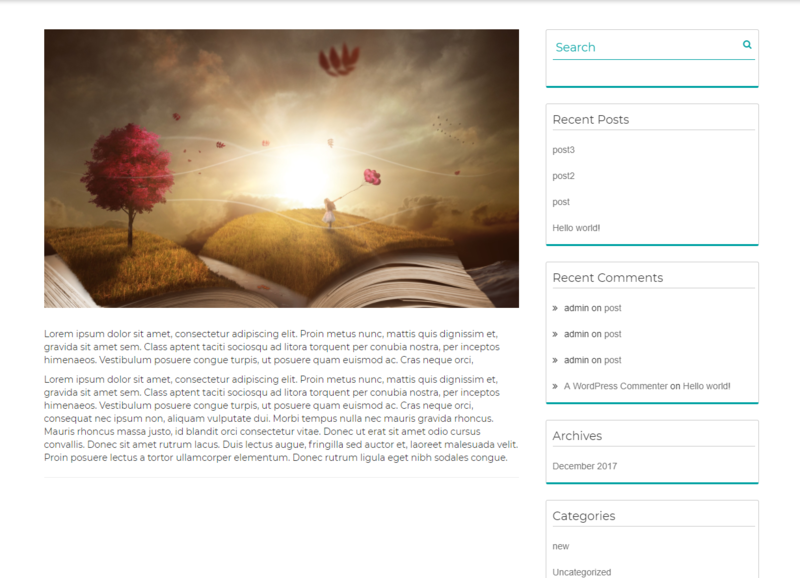 Now select a Gallery-3-template and Publish. You can use Gallery-4 template go to Admin Dashboard → Pages → Add New. 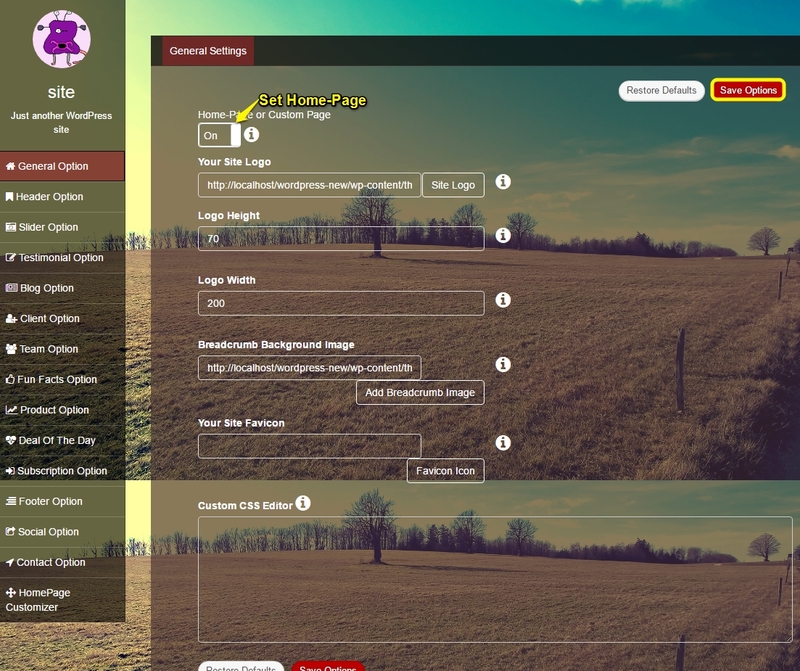 Now select a Gallery-4-template and Publish. Fashionair is a Full Responsive Multi-Purpose Theme suitable for Business , corporate office and others .Cool Blog Layout and full width page. 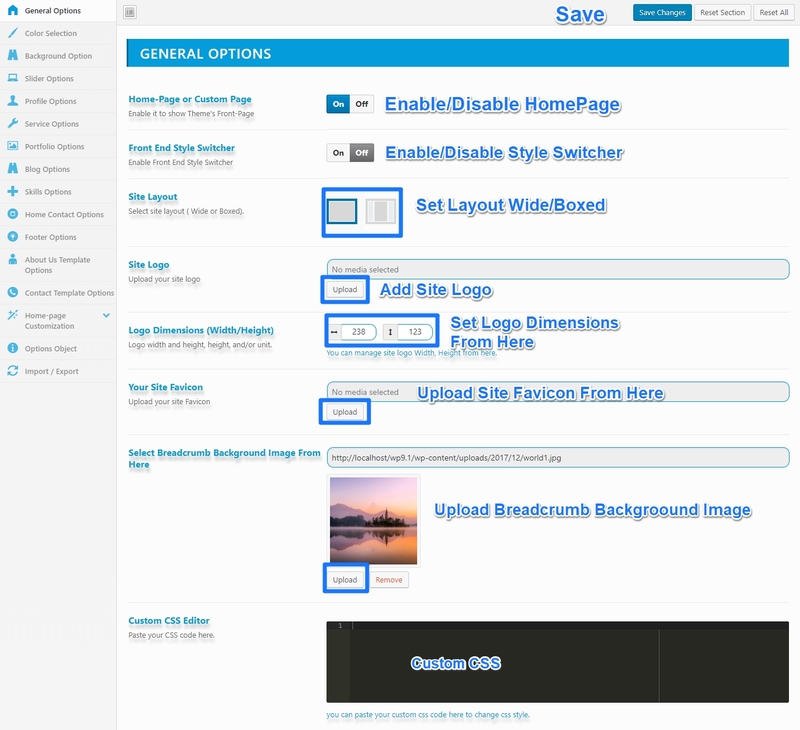 You can access theme options page or setup home page at Admin Dashboard → Appearance → Theme Options. 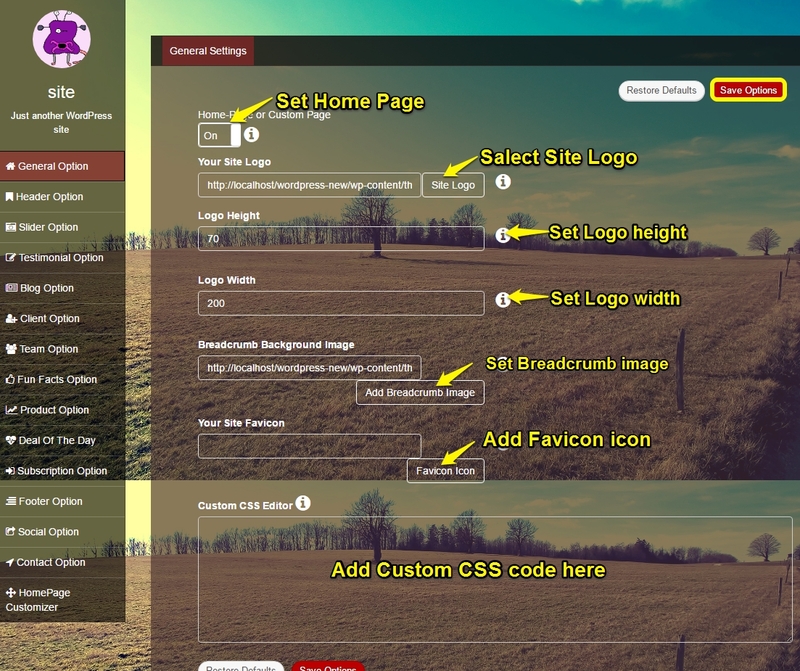 In this section you can enable home page, add a logo, logo size, add a breadcrumb background image, add site favicon and add custom css code. 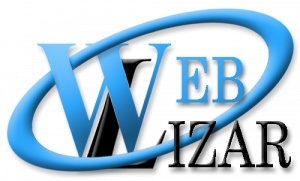 Now click on Site Logo Button and upload your logo image or select from Media Library. 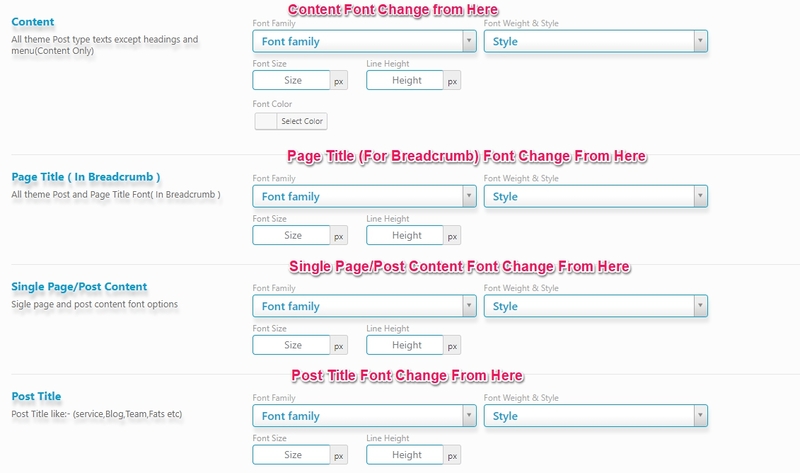 To add Breadcrumb Background Image go to Admin Dashboard → Appearance → Theme Options → General Settings. 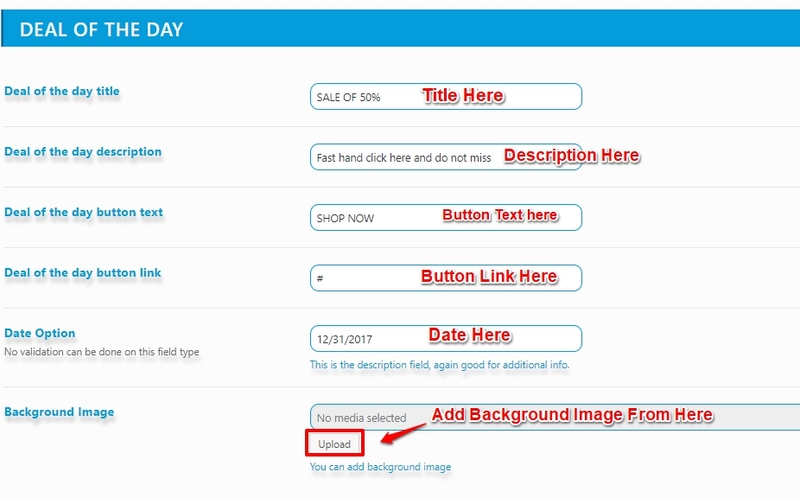 And Click on Add Background Image button and upload your background image or select from Media Library. 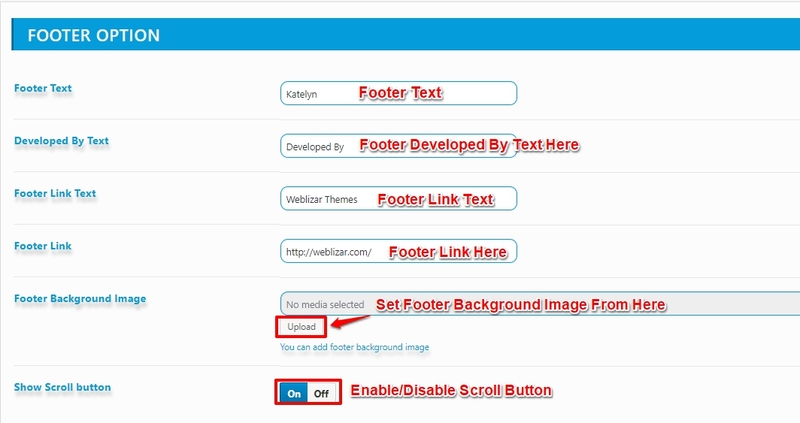 Now click on Favicon Icon Button and upload your favicon image or select from Media Library. 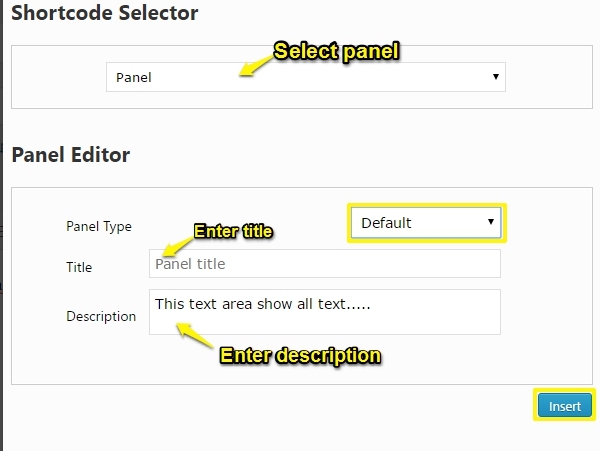 To add Custom CSS go to Admin Dashboard → Appearance → Theme Options → General Settings. You can add slides in fashionair slider. 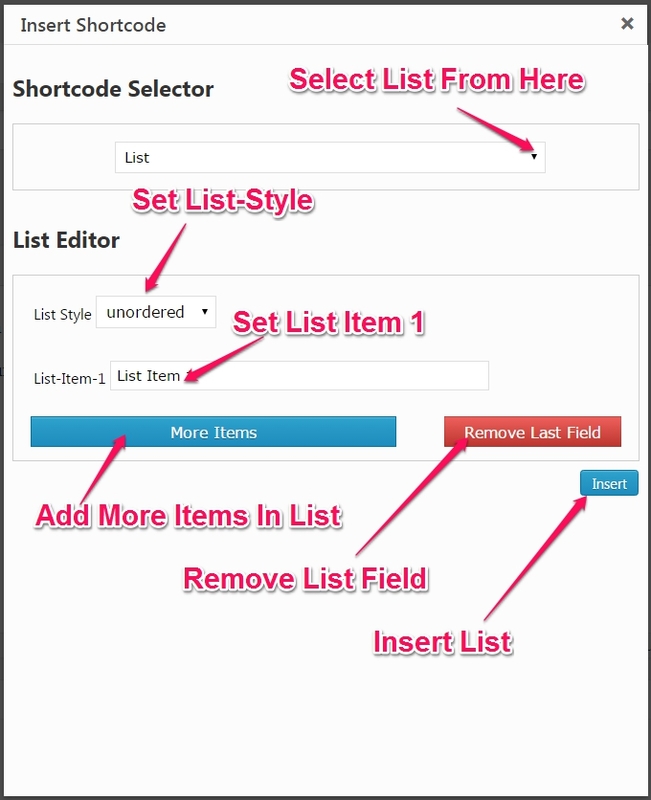 Go to Admin Dashboard → Fashionair Slider → Add New Slide and fill related details. 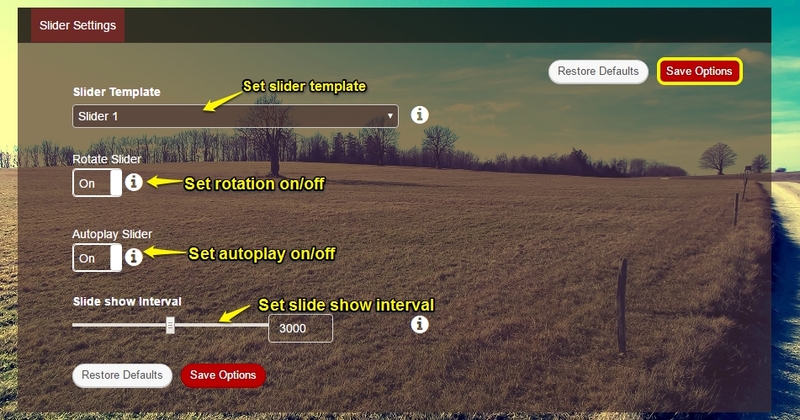 You can Customize Slider settings. You can add Testimonial to Fashionair Testimonials. Go to Admin Dashboard → Fashionair Testimonial → Add New Testimonial and fill related details. 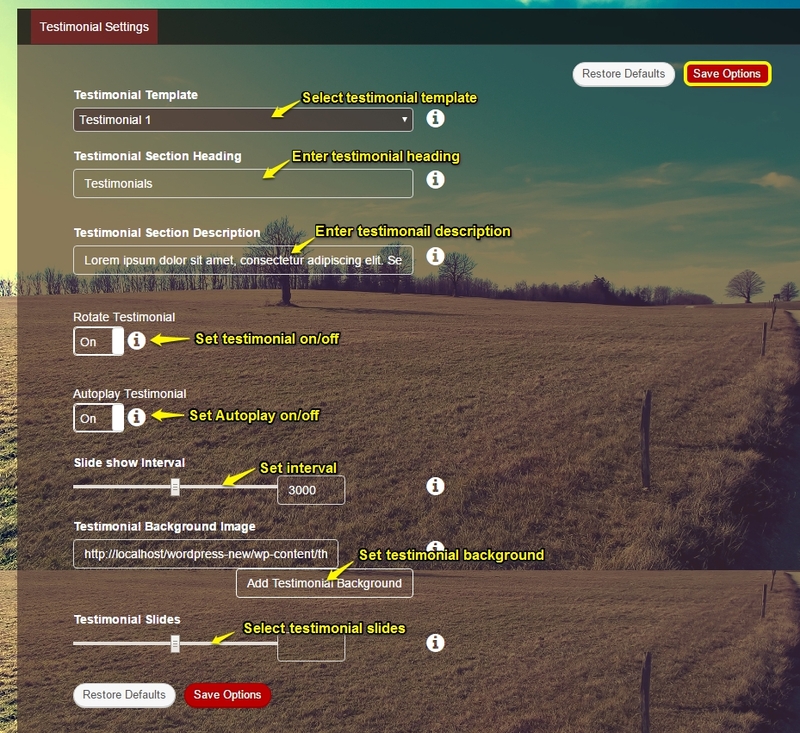 You can Customize Testimonial settings. You can add Clients to Fashionair Client. 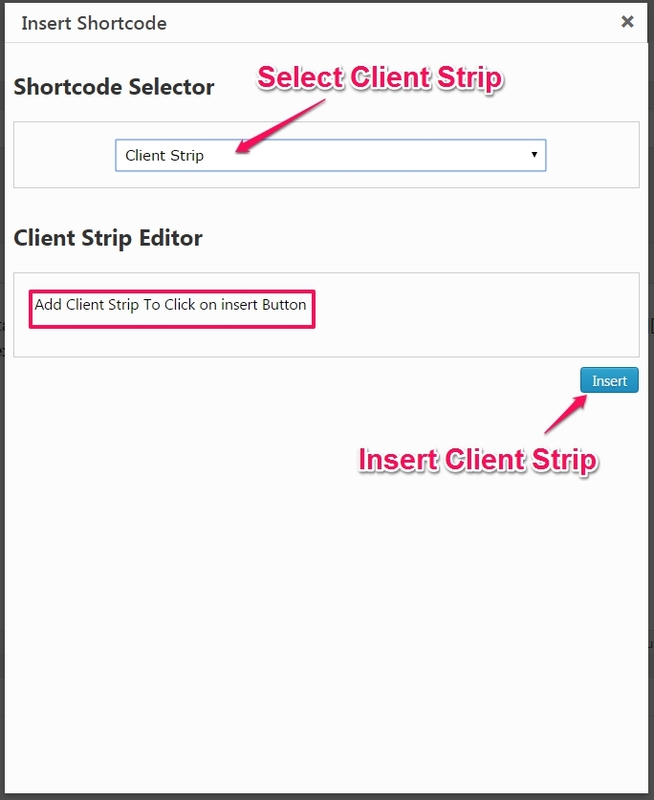 Go to Admin Dashboard → Fashionair Clients → Add New Client and fill related details. 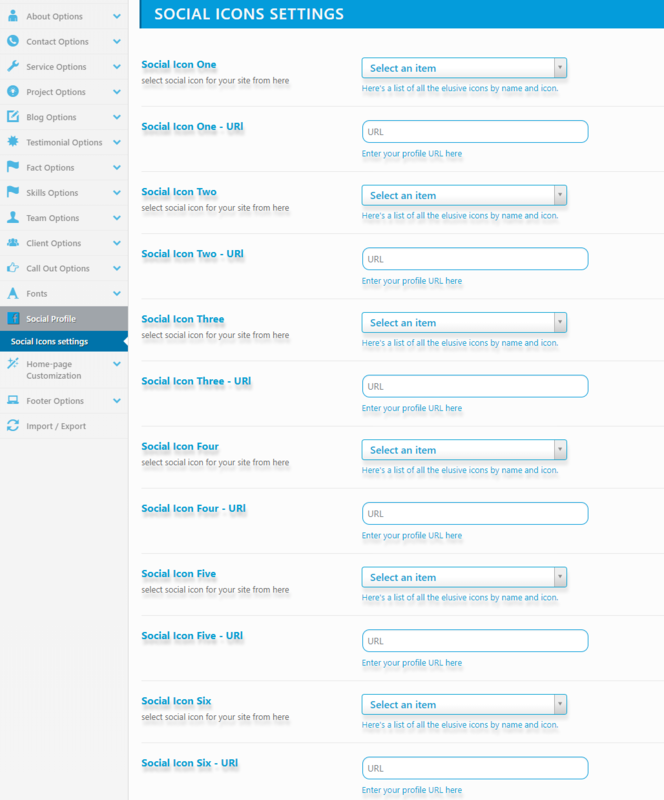 You can customize Fashionair Client Section in Theme Options Settings. You can add Facts to Fashionair Facts. 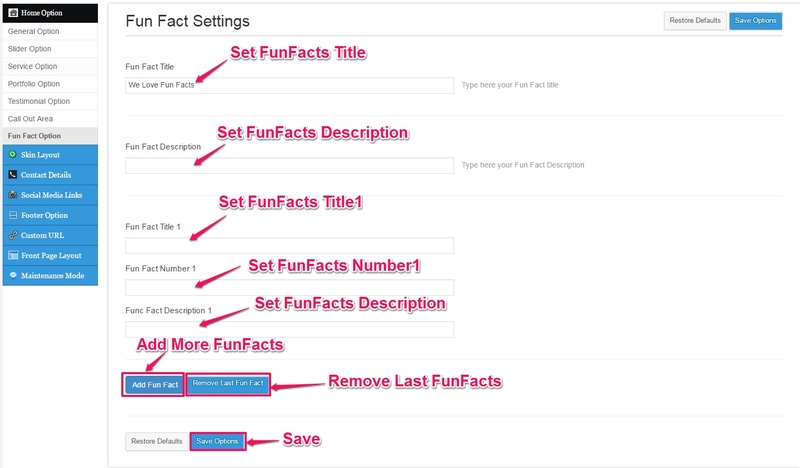 Go to Admin Dashboard → Fashionair Facts → Add New Facts and fill related details. 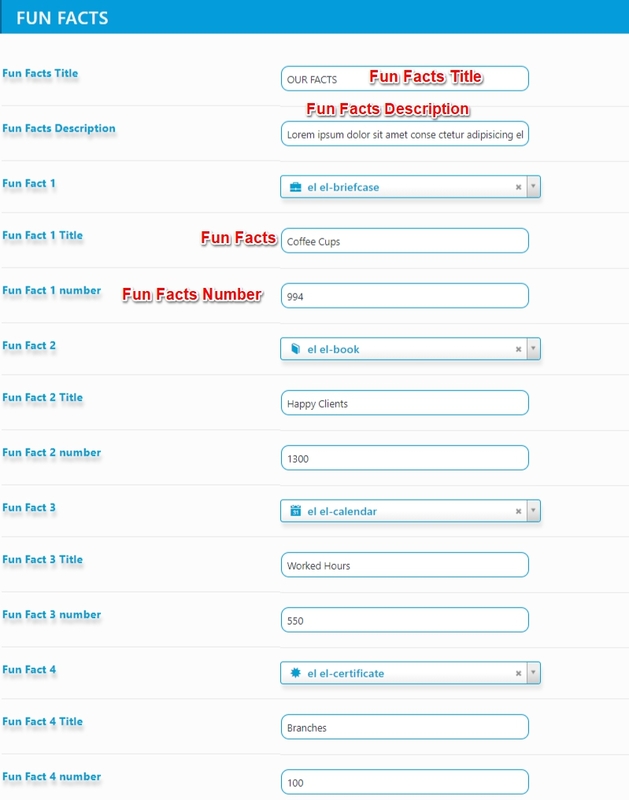 You can customize Fashionair Fun Facts. Go to Admin Dashboard → Appearance → Theme Options → Fun Facts Option. You can add Members to Fashionair Members. Go to Admin Dashboard → Fashionair Members → Add New Members and fill related details. You can customize Fashionair Team. 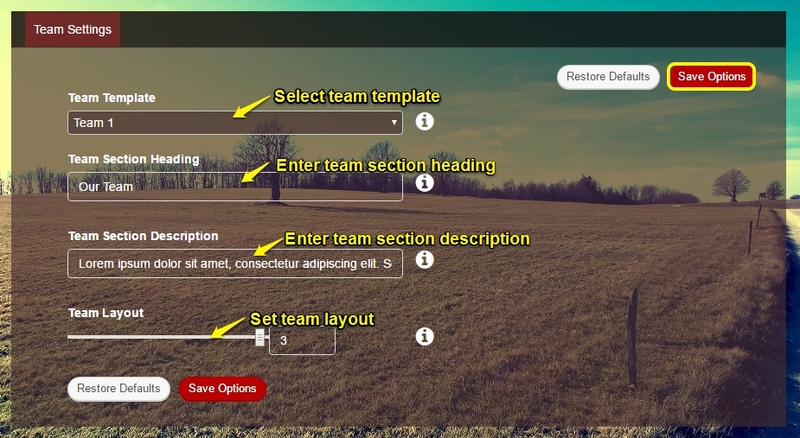 Go to Admin Dashboard → Appearance → Theme Options → Team Option. You can add Products to Fashionair Products. Go to Admin Dashboard → Fashionair Products → Add New Products and fill related details. You can customize Fashionair Products. Go to Admin Dashboard → Appearance → Theme Options → Products Option. You can customize Fashionair Header. 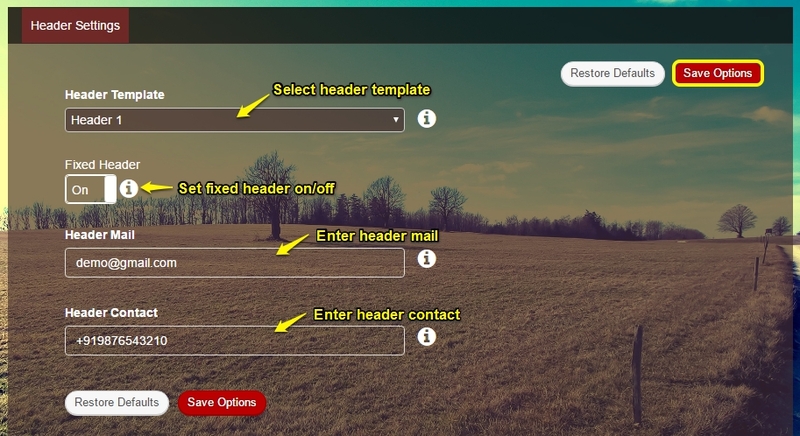 Go to Admin Dashboard → Appearance → Theme Options → Header Option. 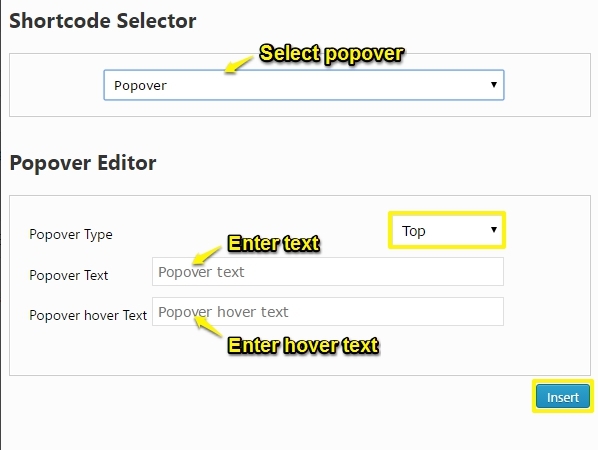 You can customize Fashionair Blog Option. You can customize Fashionair Deal of the Day Option. 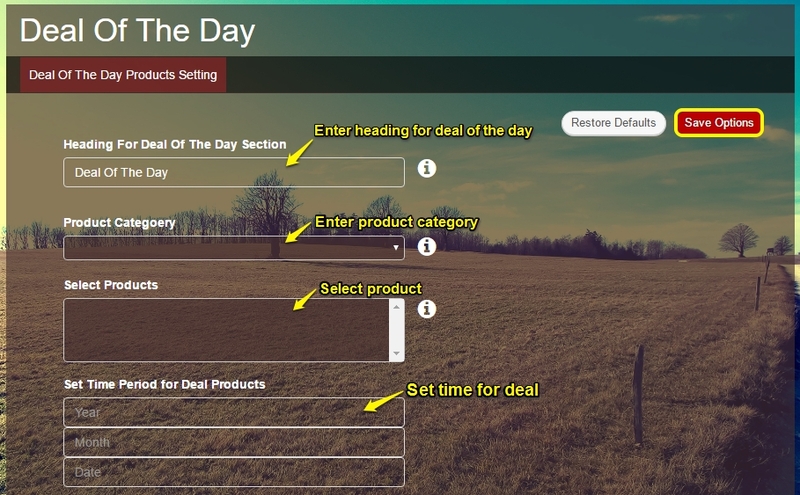 Go to Admin Dashboard → Appearance → Theme Options → Deal of the Day Option. 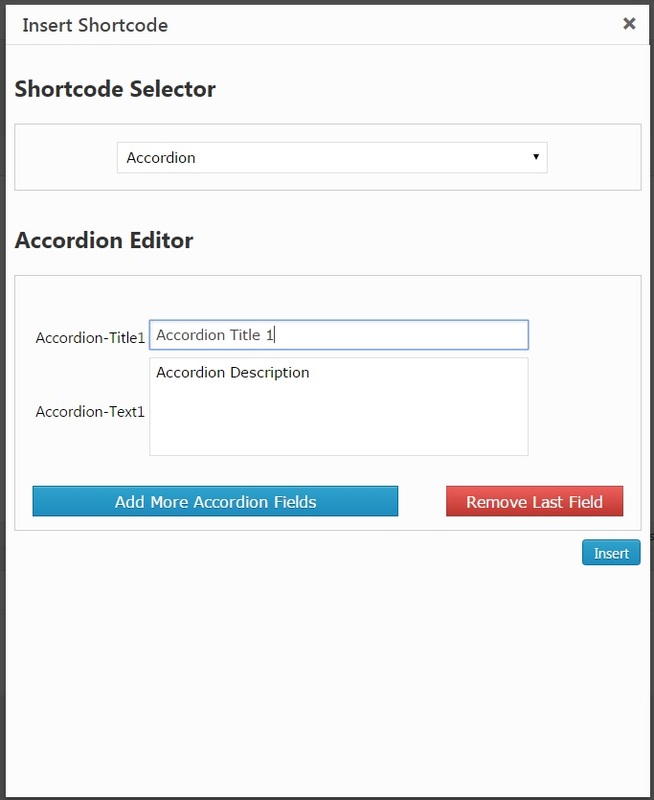 You can customize Fashionair Subscription Option. 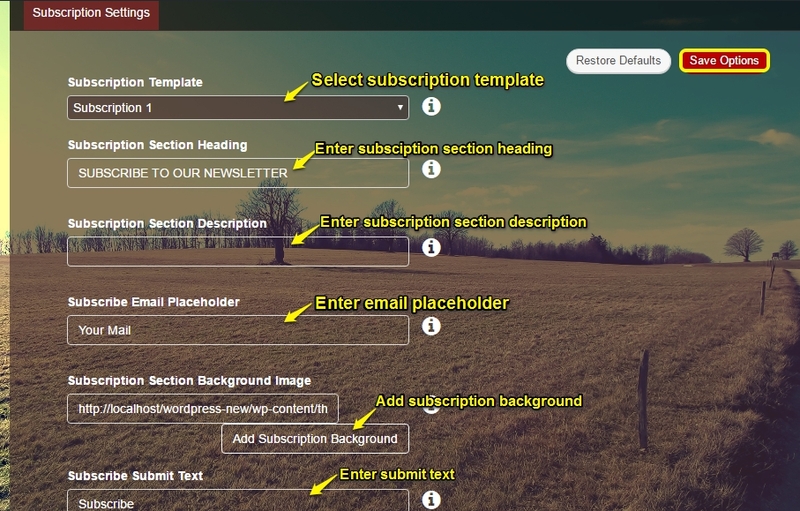 Go to Admin Dashboard → Appearance → Theme Options → Subscription Option. 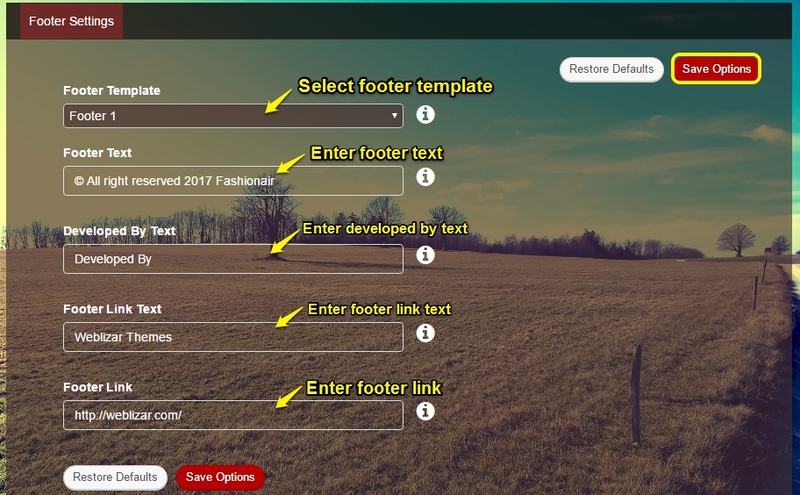 You can customize Fashionair Footer Option. 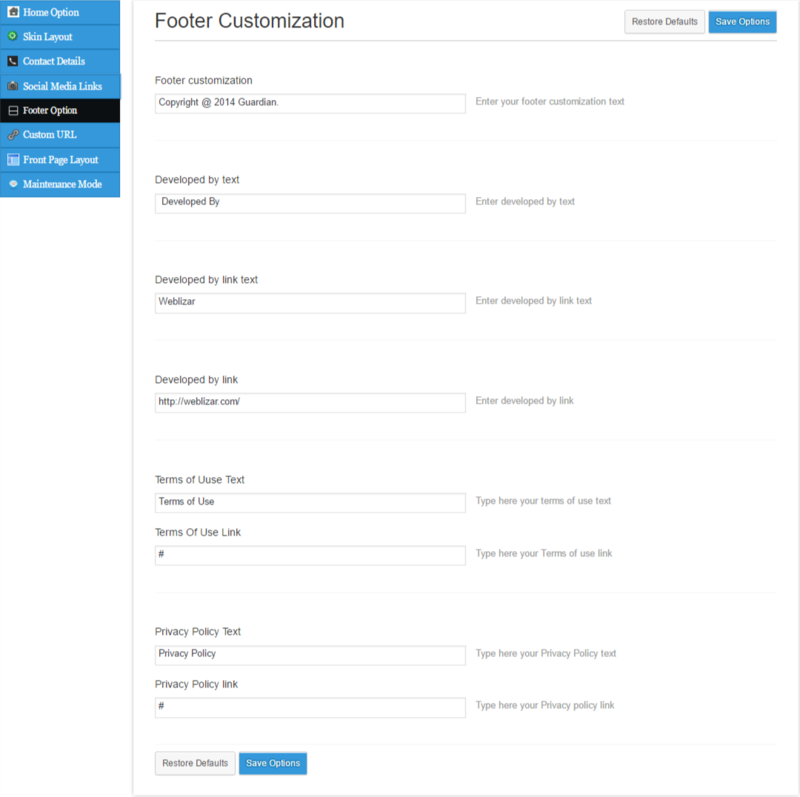 Go to Admin Dashboard → Appearance → Theme Options → Footer Option. 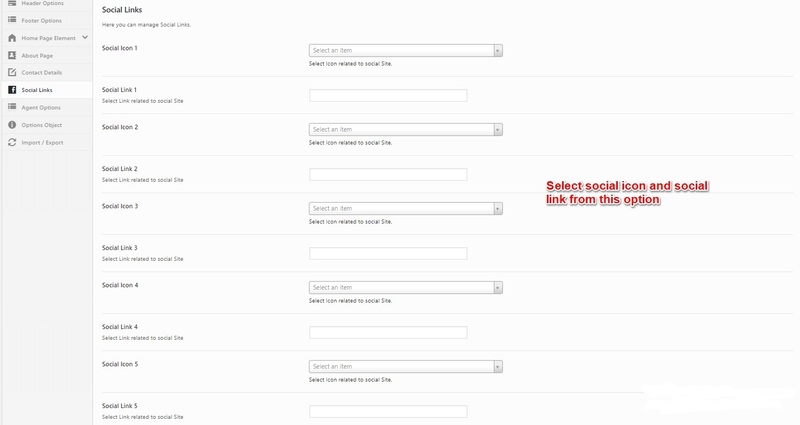 You can customize Fashionair Social Option. You can customize Fashionair Contact Option. 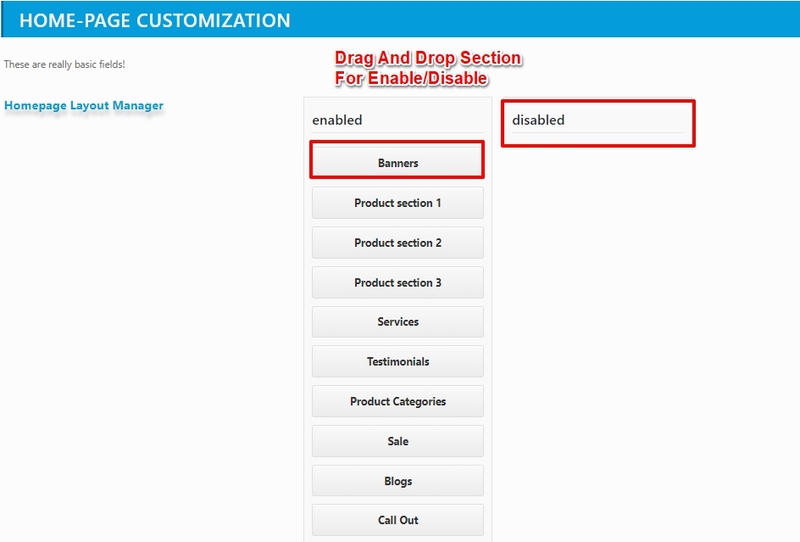 Using Home Page Customizer Option, sections on Home Page can be remove and added. The fashionair slider is always on the Top. 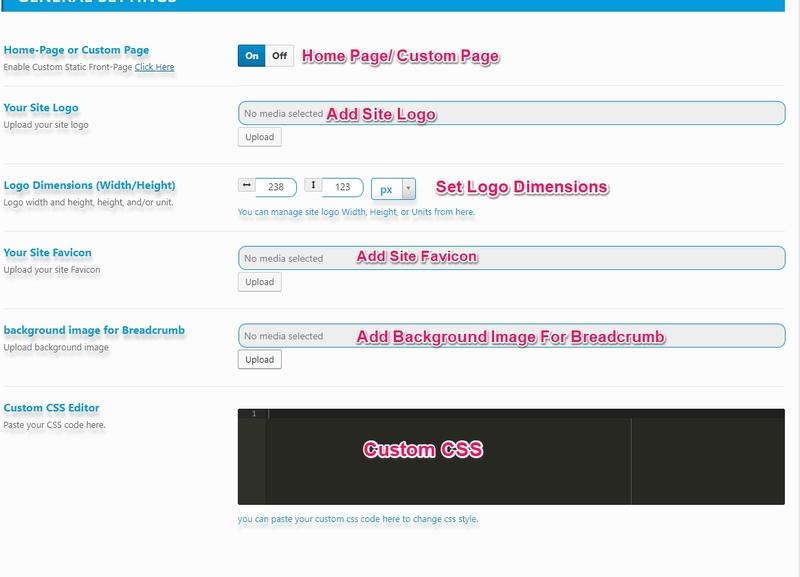 To access Home Page Customizer go to Admin Dashboard → Appearance → Theme Options → HomePage Customizer. 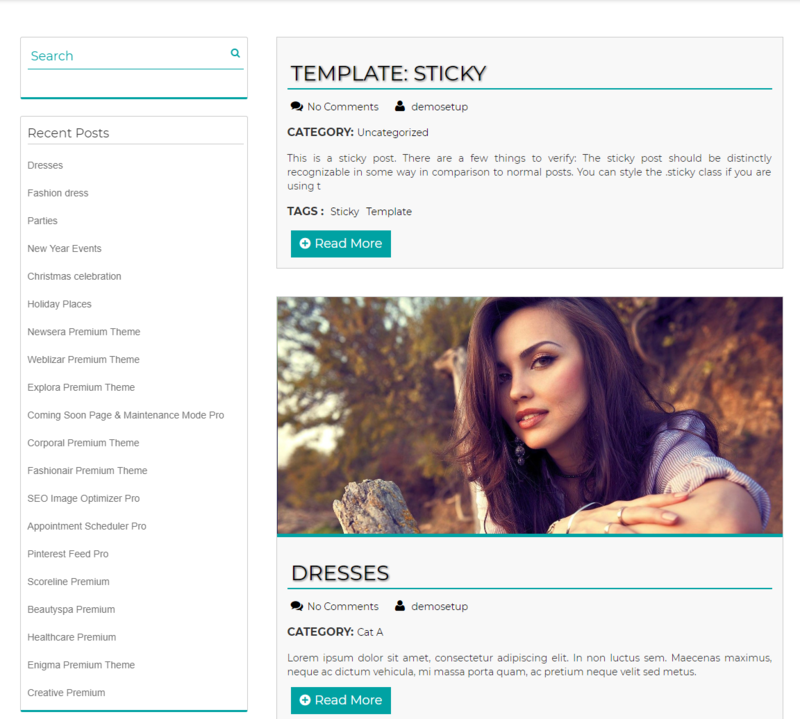 Fashionair Premium Theme provides about 11 templates. Guardian with WPML: To make your Guardian WORDPRESS theme ready with the WPML , Going Multilingual . 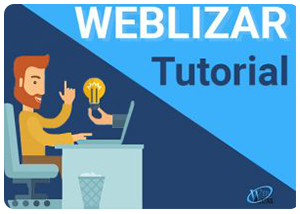 WPML SETUP : A) Install and activate the core WPML plugins (WPML Multilingual CMS, WPML String Translation, WPML Translation Management), and then other WPML plugins that may depend on them. B) Set up WPML from WPML->Languages. See WPML Getting Started Guide for complete reference, but the initial simple three-step setup is self-explanatory, asking you to choose your default language, a set of active languages, and a language selector. 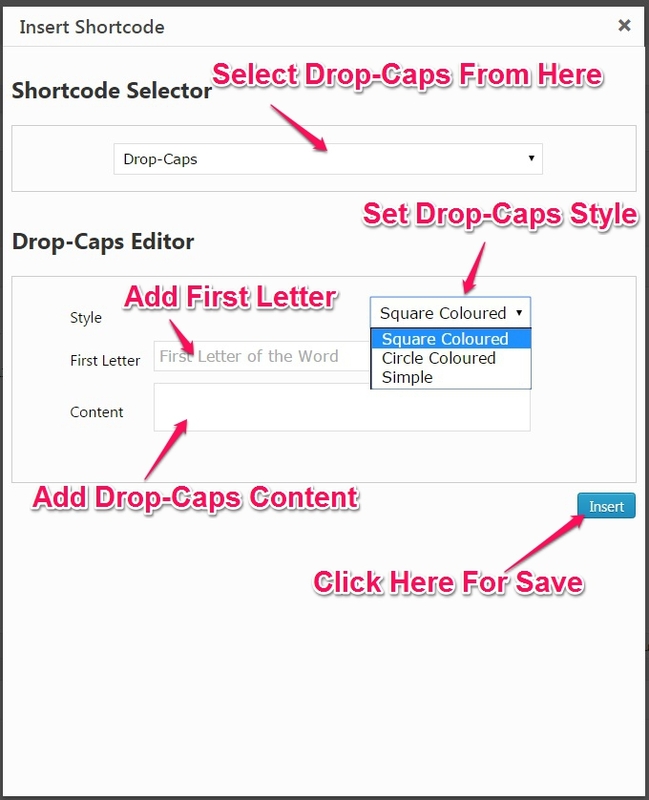 Guardian comes with extra custom post types such as services , portfolios testimonials , Clients and custom taxonomies. 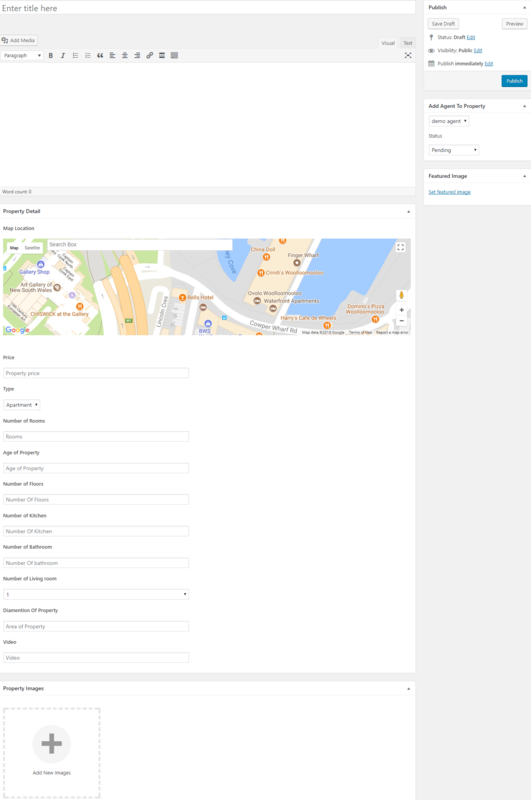 In order to get a similar interface for translation/duplication as for posts and pages, you need to go to WPML -> Translation Management, and select the tab ‘Multilingual Content Setup’. Chronicle with WPML: To make your Chronicle WORDPRESS theme ready with the WPML , Going Multilingual . 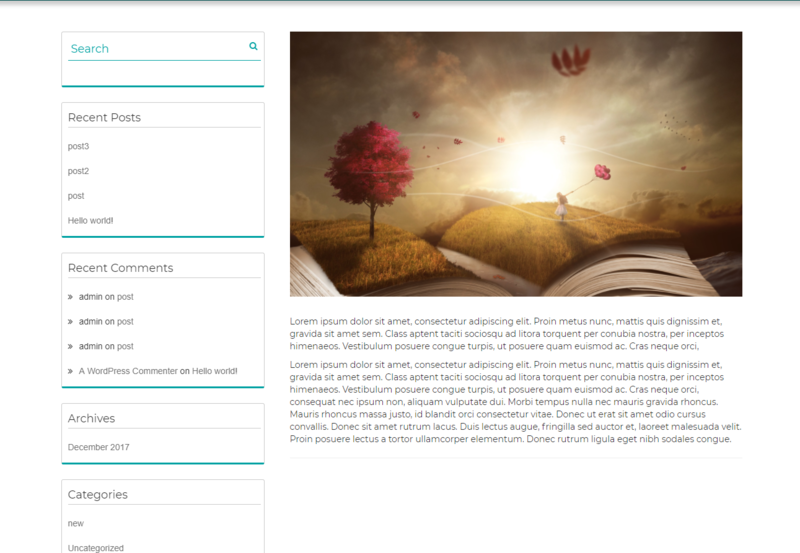 Chronicle comes with extra custom post types such as services , portfolios testimonials , Clients and custom taxonomies. 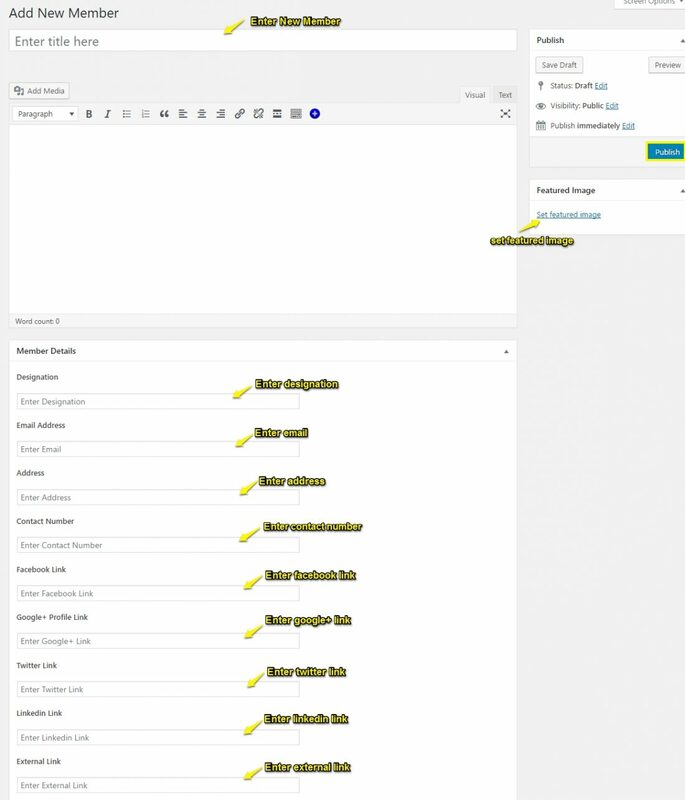 In order to get a similar interface for translation/duplication as for posts and pages, you need to go to WPML -> Translation Management, and select the tab ‘Multilingual Content Setup’. Creative with WPML: To make your Creative WORDPRESS theme ready with the WPML , Going Multilingual . Creative comes with extra custom post types such as services , portfolios testimonials , Clients and custom taxonomies. 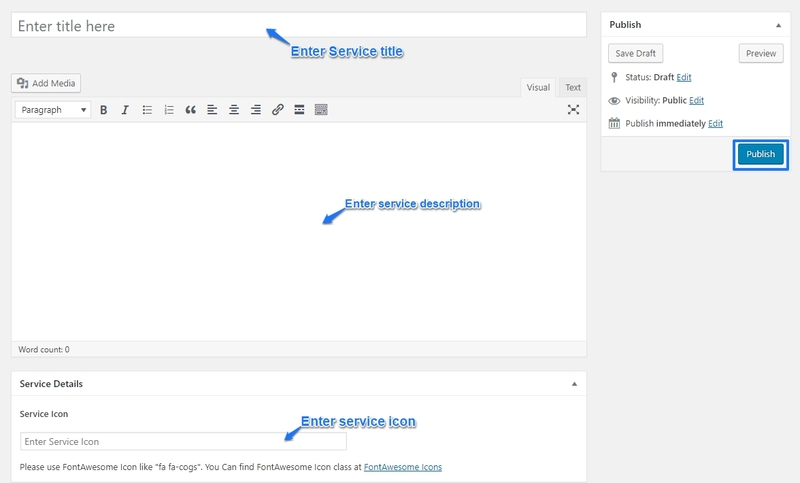 In order to get a similar interface for translation/duplication as for posts and pages, you need to go to WPML -> Translation Management, and select the tab ‘Multilingual Content Setup’. Beautyspa with WPML: To make your Beautyspa WORDPRESS theme ready with the WPML , Going Multilingual . 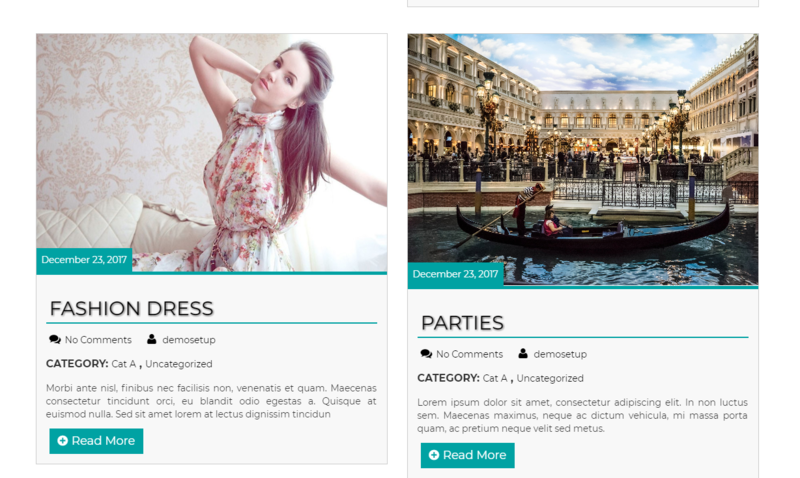 Beautyspa comes with extra custom post types such as services , portfolios testimonials , Clients and custom taxonomies. 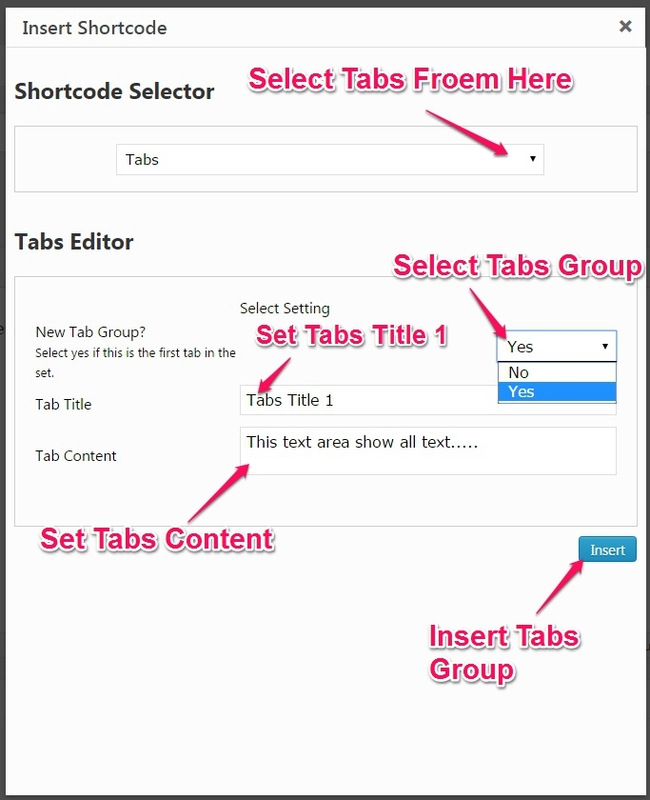 In order to get a similar interface for translation/duplication as for posts and pages, you need to go to WPML -> Translation Management, and select the tab ‘Multilingual Content Setup’. 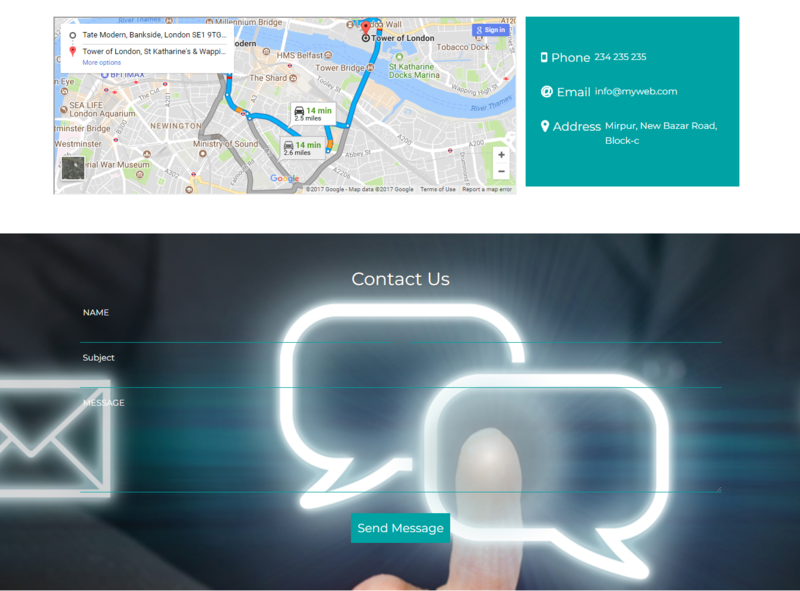 A Responsive WordPress Theme for Business, Portfolio and Corporate World. 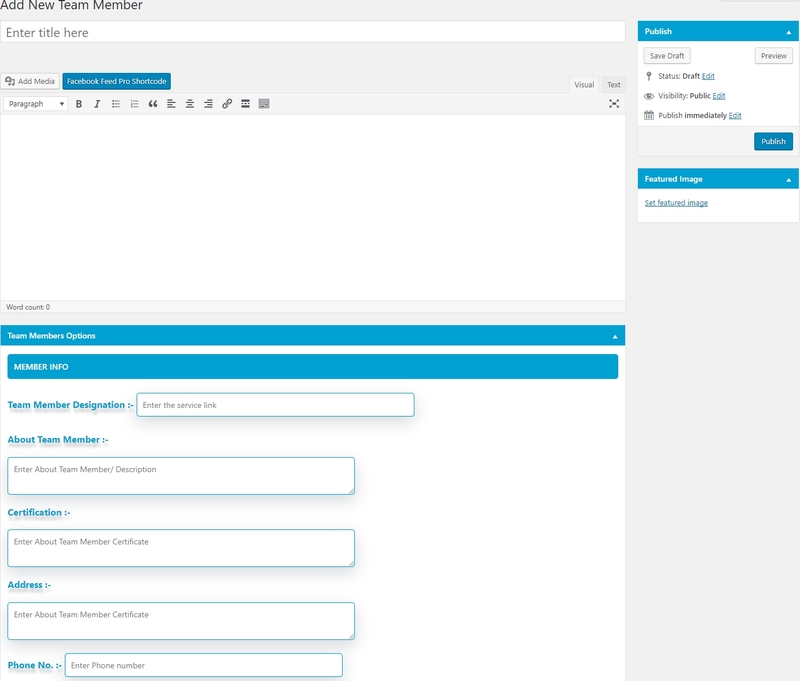 After that Activate theme into WordPress site Admin Dashboard -> Appearance -> themes. 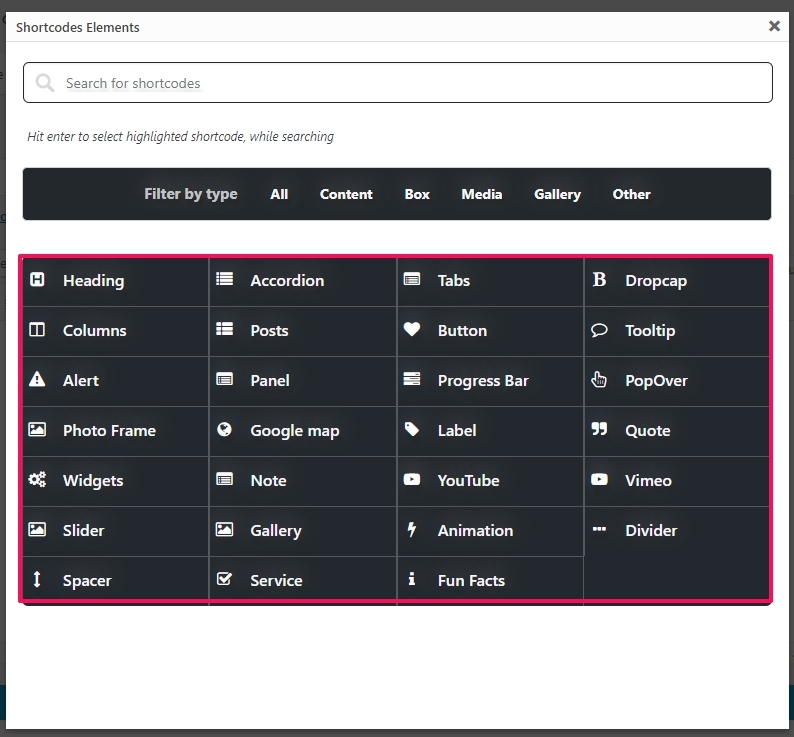 You can access theme options page at Admin Dashboard → Appearance → Guardian Options. 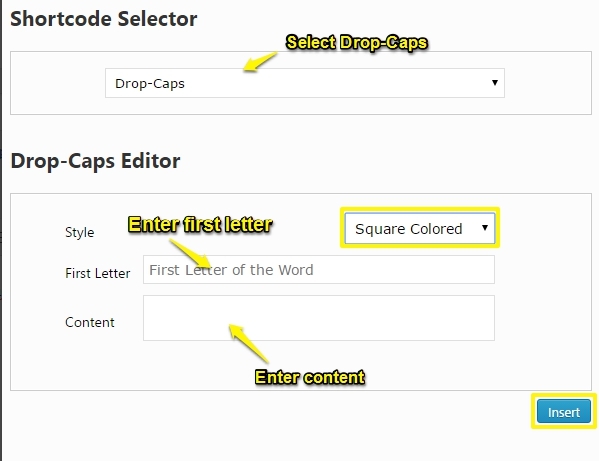 In this section, you can Enable Your WordPress Blog Title as a LOGO, add a logo, logo size, Site Favicon, add custom CSS, add google analytic code etc. Please go to Admin Dashboard → Appearance → Guardian Options → General Settings. 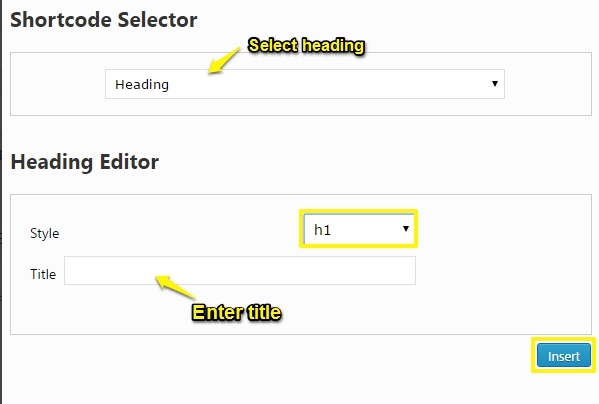 To Enable Your WordPress Blog Title to Admin Dashboard → Appearance → Guardian Options → General Settings. To add Logo go to Admin Dashboard → Appearance → Guardian Options → General Settings. NOTE: Logo height is Set to 50px for fixed header, if fixed header is enabled and when you scroll the page, Logo will set to 60px height in fixed menu. 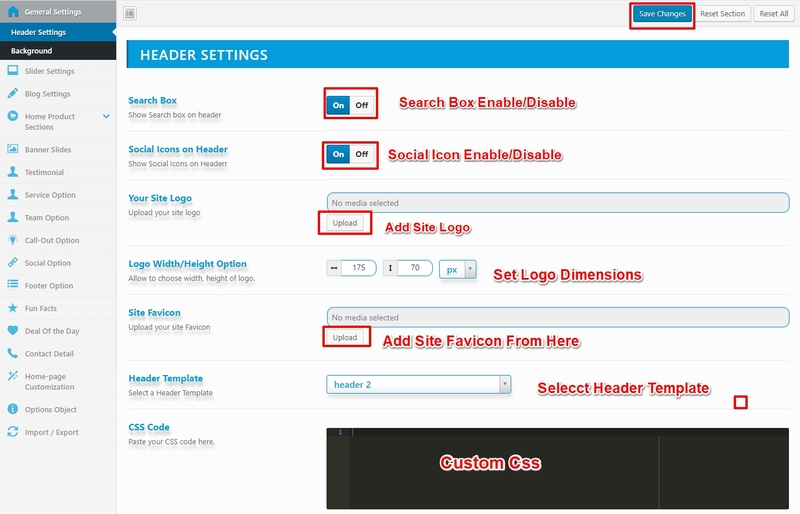 To add Favicon go to Admin Dashboard → Appearance → Guardian Options → General Settings. 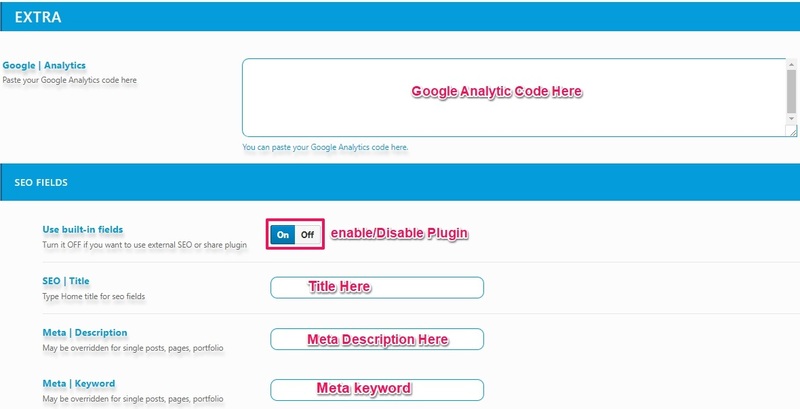 Note: Please add Google Analytic Code without script tag. Please don’t use >, < like symbol in custom CSS editor. Add a slide to Guardian Slider. You can customize Guardian Slider in Theme Options Settings. 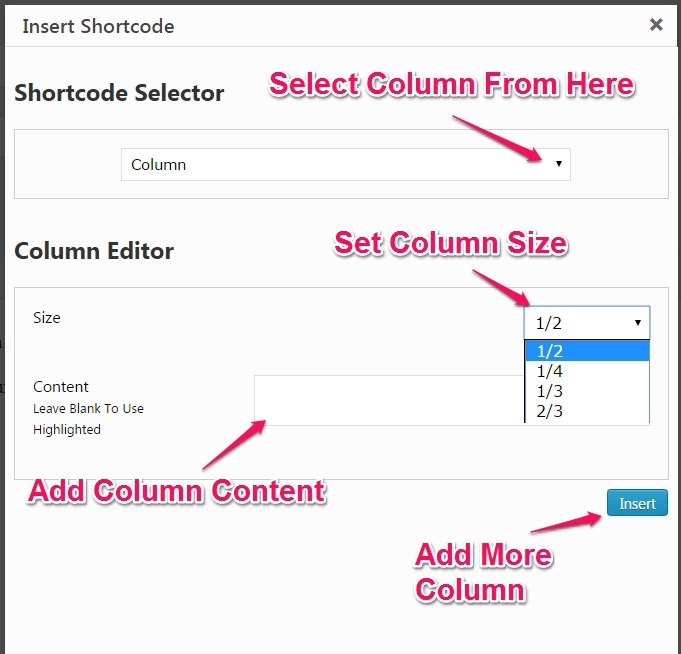 Go to Admin Dashboard → Appearance → Guardian Options → Slider Setting. Add Service to Guardian Services. Go to Admin Dashboard → Guardian Service → Add New Service and fill related details. You can customize Guardian Services in Theme Options Settings. 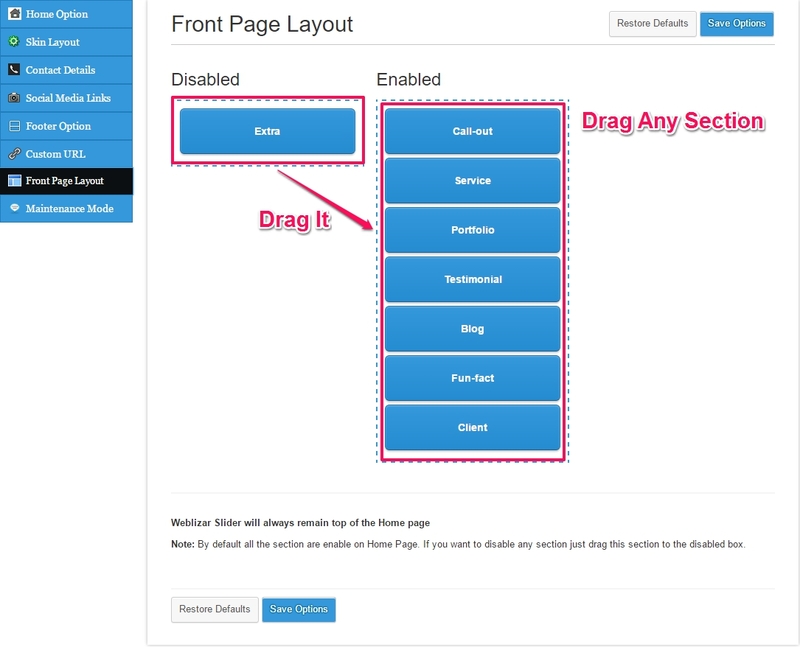 Note: Home Page Extra Option can manage by Front Page Layout Option You can set extra section anywhere after or before of any section. Add Portfolio to Guardian Portfolios. 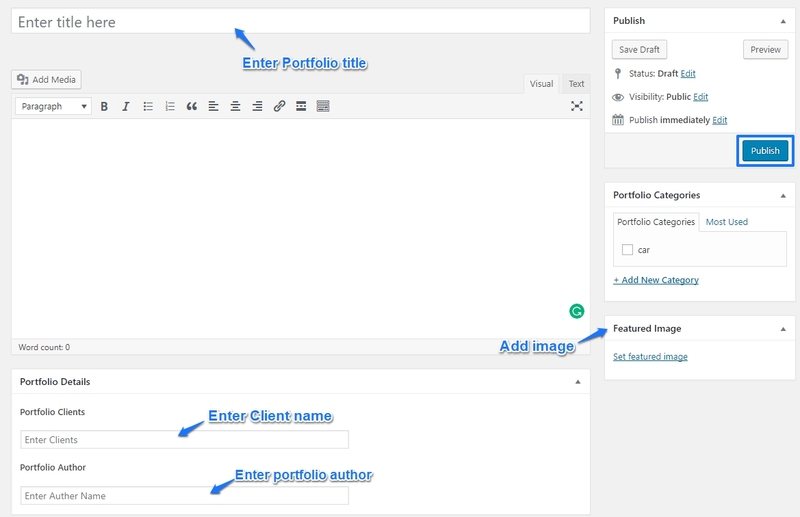 Go to Admin Dashboard → Guardian Portfolio→ Add New Portfolio and fill related details. 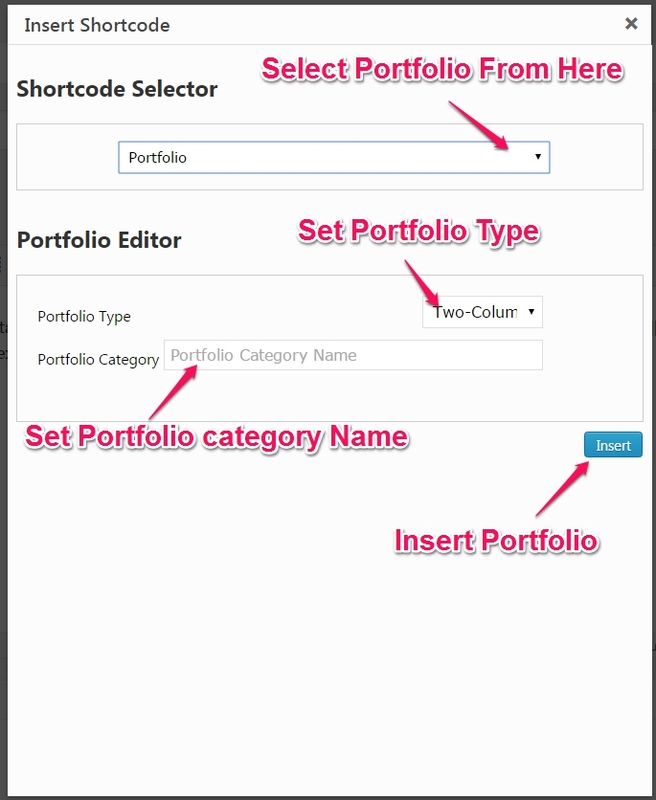 Go to Admin Dashboard → Appearance → Guardian Options → Portfolio Setting. Add Testimonial to Guardian Testimonials. Go to Admin Dashboard → Guardian Testimonial → Add New Testimonial and fill related details. 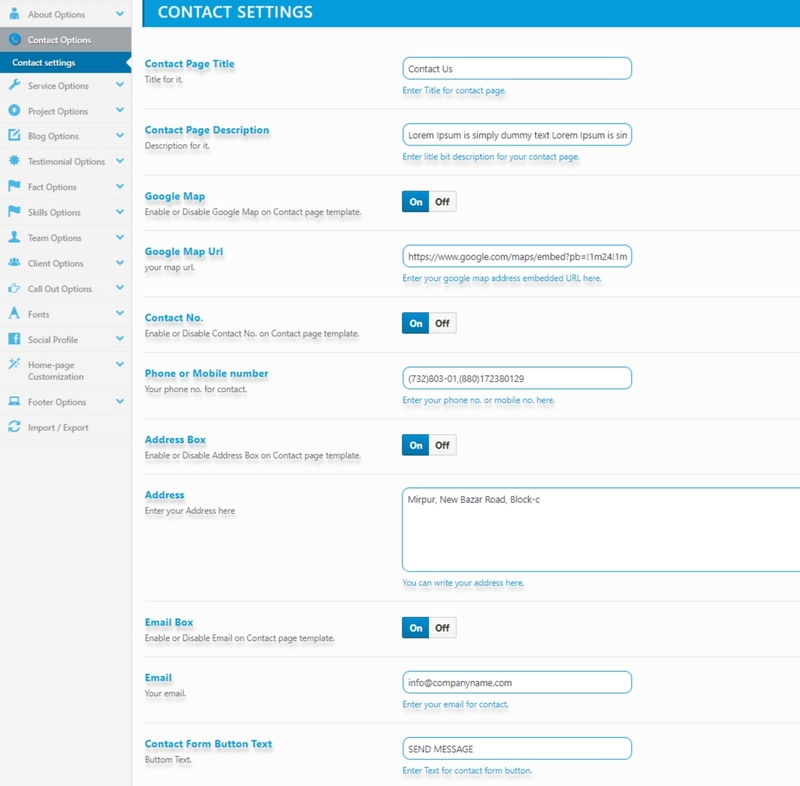 You can customize Guardian Testimonial Section in Theme Options Settings. 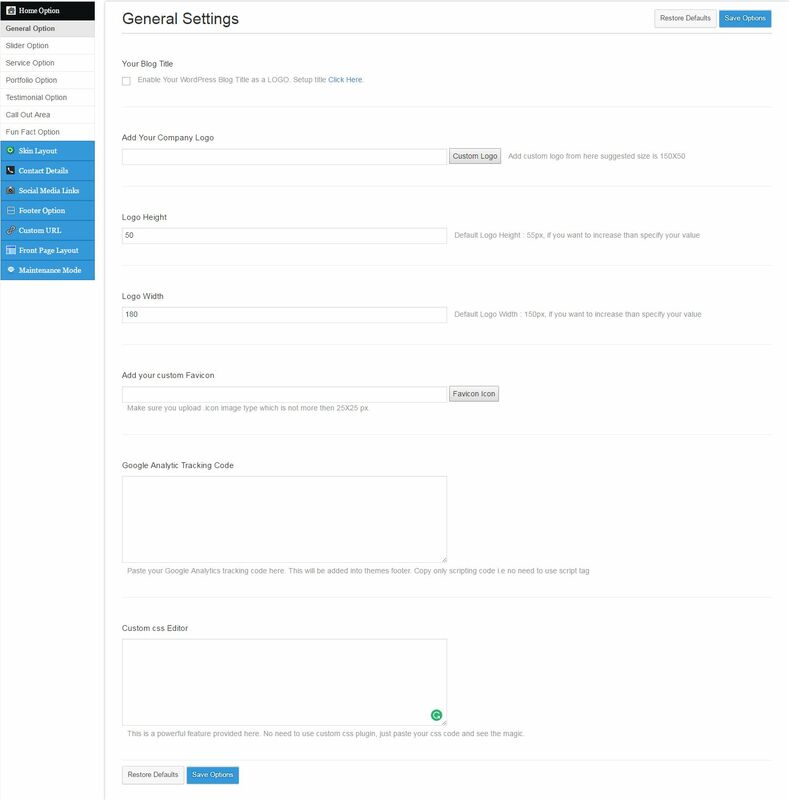 Go to Admin Dashboard → Appearance → Guardian Options → Testimonial Option. Add Member to Guardian Client. Go to Admin Dashboard → Guardian Clients → Add New Client and fill related details. Go to Admin Dashboard → Guardian Clients → Add New Team and fill related details. 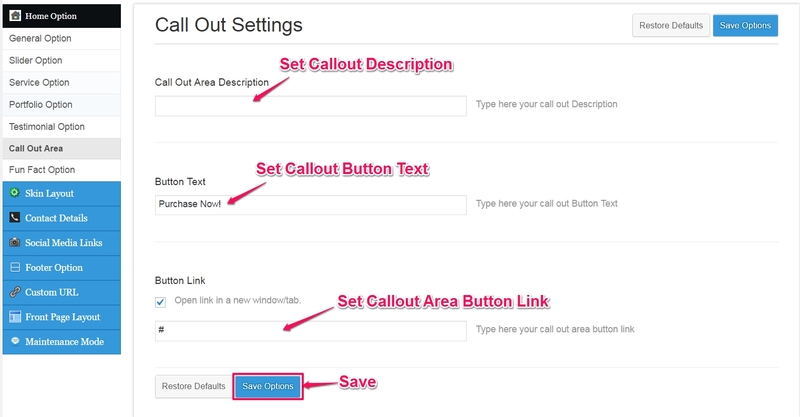 Go to Admin Dashboard → Appearance → Guardian Options → Callout Option. Go to Admin Dashboard → Appearance → Guardian Options → Fun Fact Option. 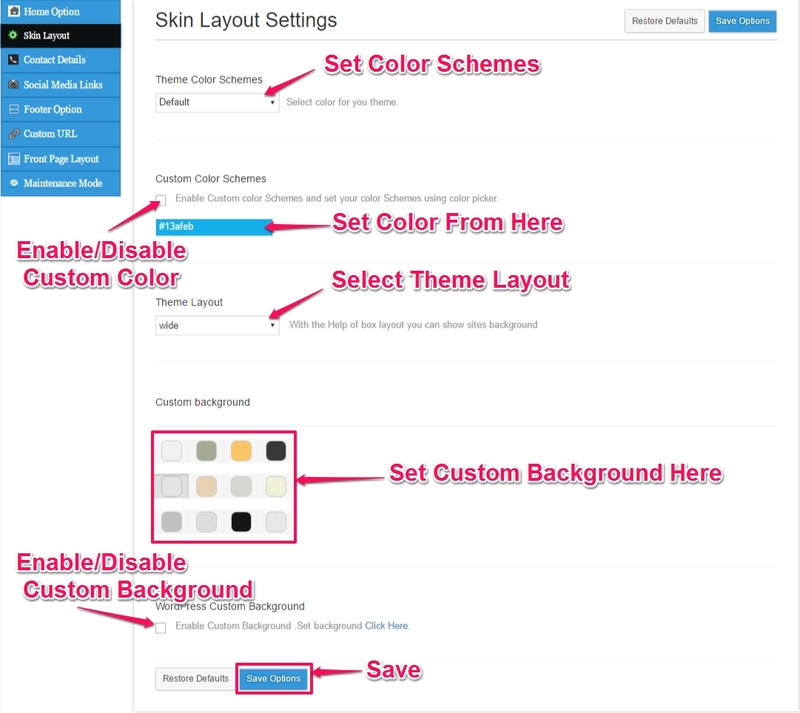 Go to Admin Dashboard → Appearance → Guardian Options → Skin Layout Option. Go to Admin Dashboard → Appearance → Guardian Options → Contact Option. 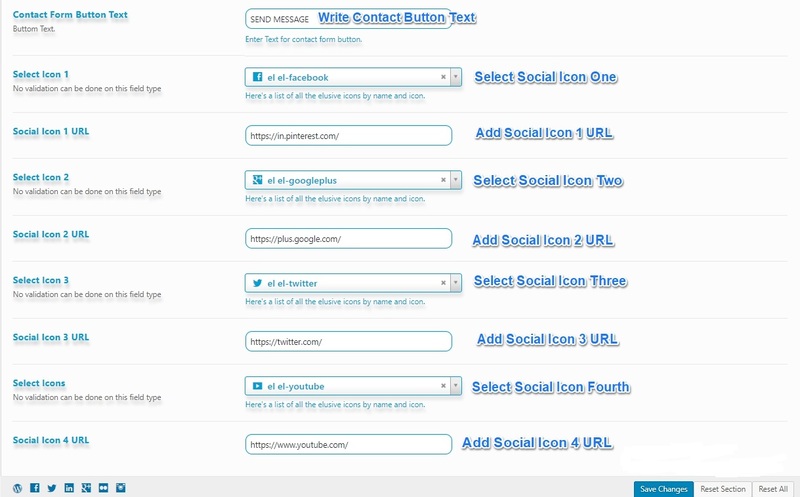 You can customize Social Icon Link in Theme Options Settings. 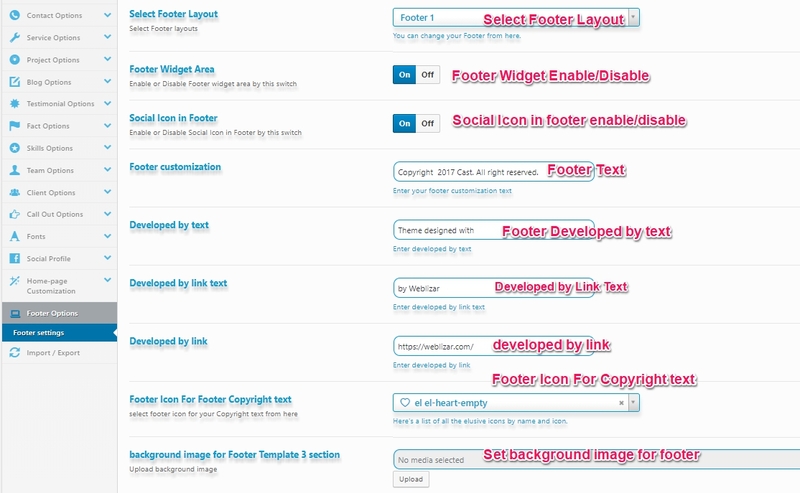 Theme Footer Widget Area has default Widgets. 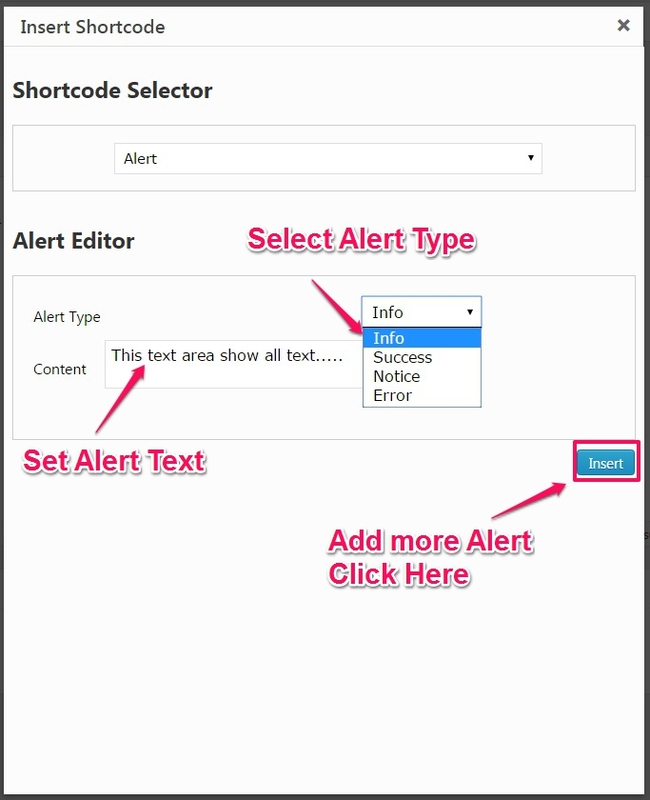 Please go to Admin Dashboard → Appearance → Guardian Options → Footer Options. Using Front Page Layout settings, sections on Home Page can be removed and move. The Guardian slider is always on the Top. 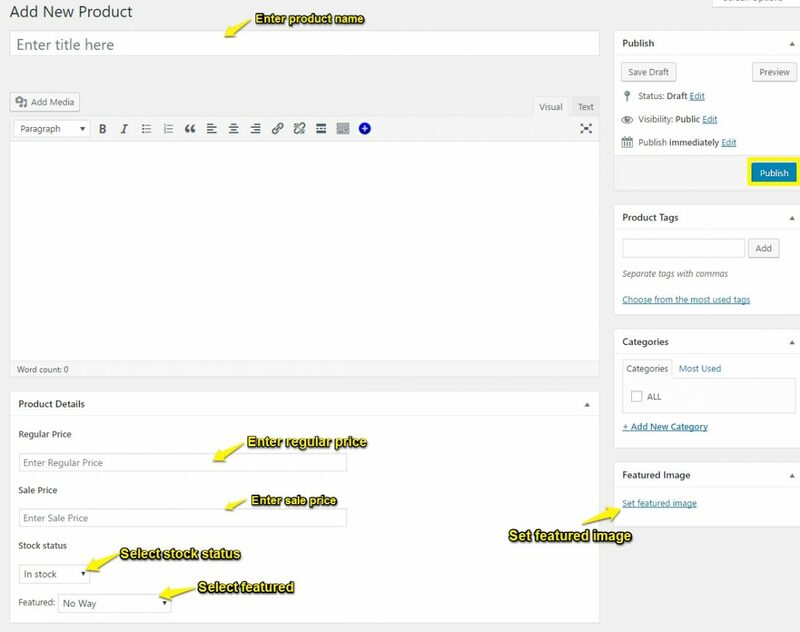 To access Home Page Customizer go to Admin Dashboard → Appearance → Guardian Options → Front Page Layout. 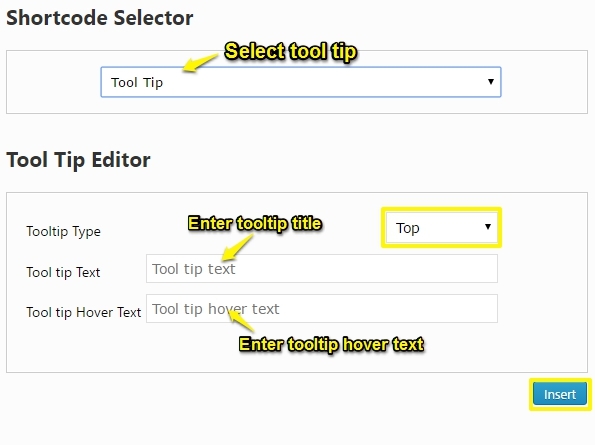 Guardian provides an option to use your own Maintenance Mode. 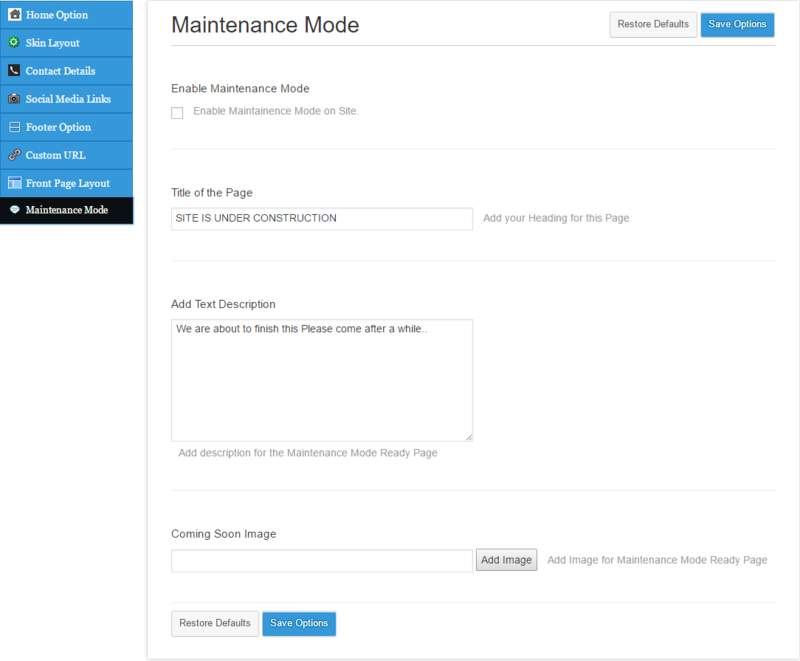 You can Enable/Disable Maintenance Page at Admin Dashboard → Appearance → Guardian Options → Maintenance Mode. 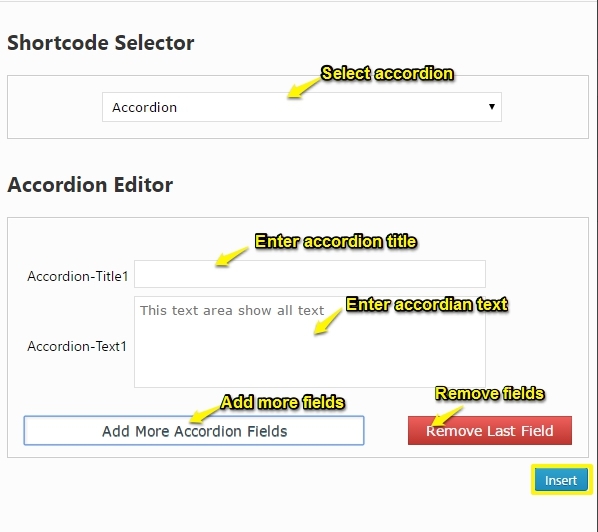 You can add more Accordion and remove Accordion. 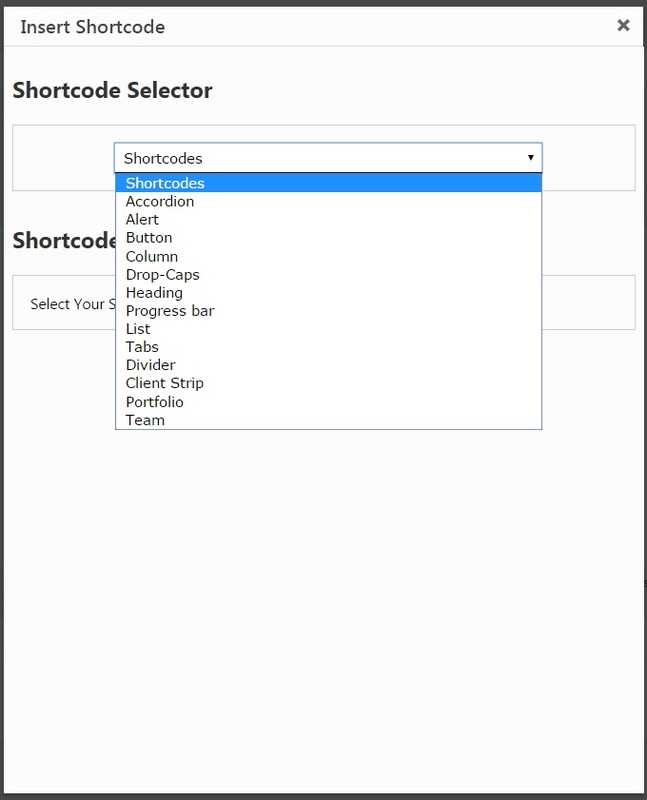 copy this shortcode and paste to a page where you want to show shortcode.